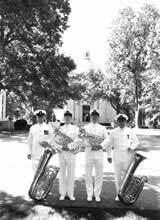 The following is an online written and pictorial archive documenting more than a 150 years of the United States Naval Academy Band. High resolution images open a new browser window. Dates and identities are made to the best of our abilities, using the Naval Academy Archives and members of the U.S. Naval Academy Band Alumni Association as references. If you have photos you'd consider lending, additions, or corrections to any captions, please contact our Public Affairs Office. Originally prepared by Master Chief Musician (Ret) David Hanner and Master Chief Musician (Ret) Jim Cunningham. 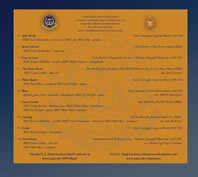 Currently updated and maintained by Band Historian, Chief Musician Pat Sarracco and USNA Band PAO. 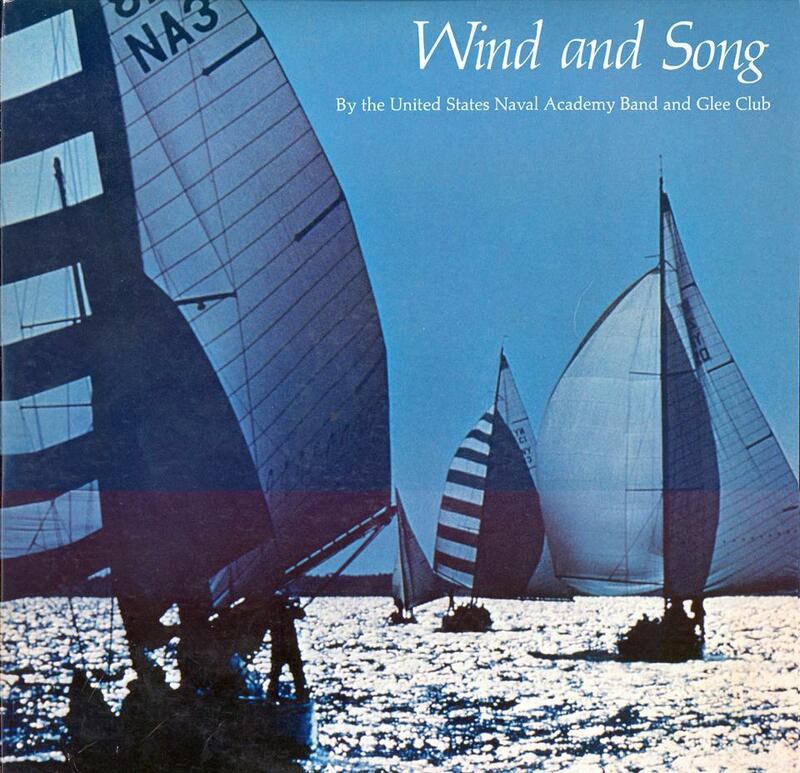 The United States Naval Academy Band is the oldest band in the United States Navy, the third oldest active duty military band in America, and one of the oldest professional musical organizations in the country. 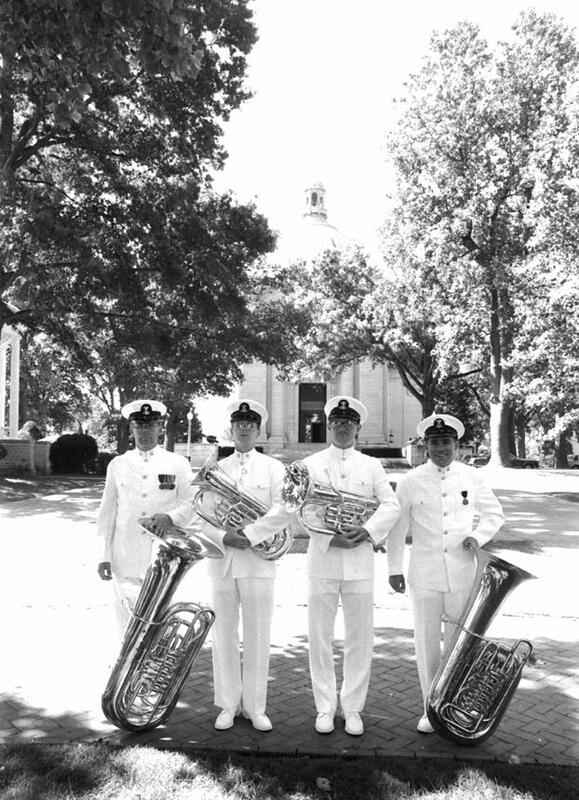 The band was officially founded on November 22, 1852; however, instrumental music on the Naval Academy Yard can be traced back to the establishment of the Naval Academy in 1845. William Hoeke and Tommy Diggins were two of the first Marine Musicians who served during the Academy's early years, but their replacements, John Jarvis (drummer) and William Bealer (fifer), are the most remembered due to their many years at the Academy. The fifer and drummer signaled reveille, tattoo, morning roll call, assembly, meals, morning and evening studies, and sick call. The new Naval School didn't wait long to host its first social event. On January 15, 1846, just three months after the school opened, a naval ball was held. 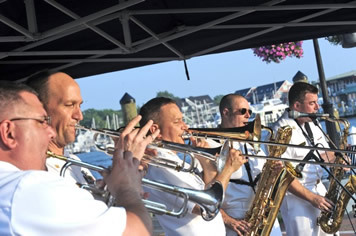 Arrangements were made for the United States Marine Band to travel from Washington D.C. to Annapolis by barge to provide music for the event. Midshipman Charles Hunter, who was on duty that day, recorded the band's arrival in the Officer of the Day Journal: "The U.S. Marine Band arrived from Washington and reported for duty." In 1848, Professor Henry Lockwood, instructor in natural philosophy, commanded the Academy's first dress parade, but there was as yet no band. 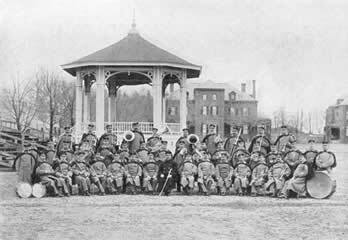 Local civilian musicians were hired for the social occasions, and the fife and drum provided the martial music. 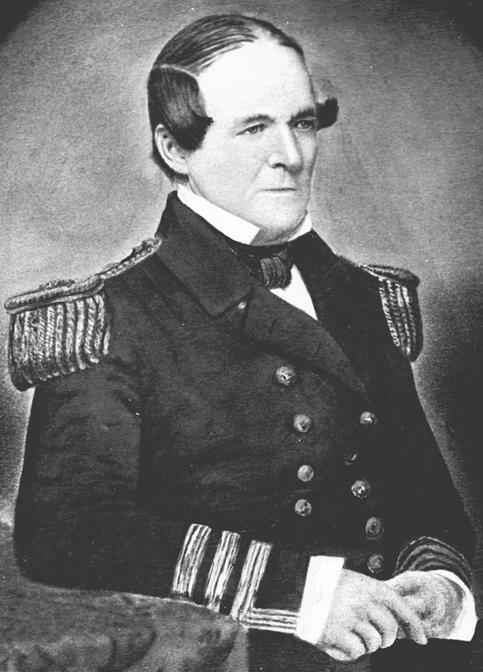 Commander Cornelius K. Stribling became Superintendent in 1850, and the Naval School was placed under the control of the Bureau of Ordnance and Hydrography, and renamed The United States Naval Academy. Stribling was advised by the Board of Examiners to provide a source of recreation for the midshipmen and "a more rigid observance of those Military forms and ceremonies, which are so essential in the order and discipline of the Navy." 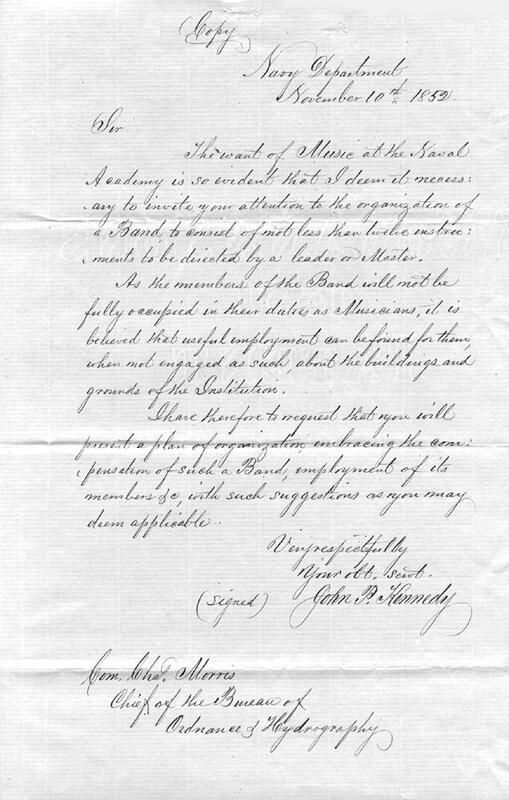 On November 10, 1852, John Pendleton Kennedy, Secretary of the Navy, wrote a letter to Commodore Charles Morris, Chief of the Bureau of Ordnance and Hydrography, requesting a plan for the establishment of a band at the Naval Academy. Commodore Morris issued an order on November 22, 1852, authorizing for the Naval Academy, "a band of music to consist of one master of the band at $18.00 per month, six musicians at $12.00 per month and five at $10.00 per month." 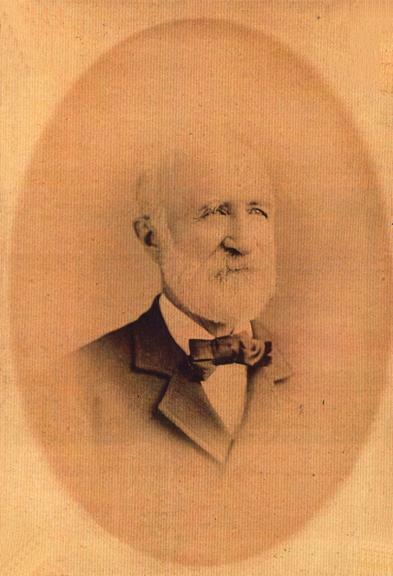 The person chosen to organize the new unit was John Philip Pfeiffer, a former Navy Musician and Bandmaster of considerable reputation. All the musicians selected were enlisted on board the Receiving Ship "OHIO" and by May 10, 1853, transferred from the "OHIO" to the barque "UNION" to sail to Annapolis. On May 17, 1853, Midshipman Edwin H. Dooley documented the band's arrival in the Naval Academy OOD Journal: "At 7:30 the barque 'UNION' came to anchor in the harbor, having onboard a 'Band' for the Academy." The first band members included: John P. Pfeiffer, Robert Haas, John G. Pfeiffer, O. Pillarty, L. (S) Reuther (Reuter), Rudn, Stelezer, Strutton, Henry Vierling, Weitzel, and Wurth (Wirth). 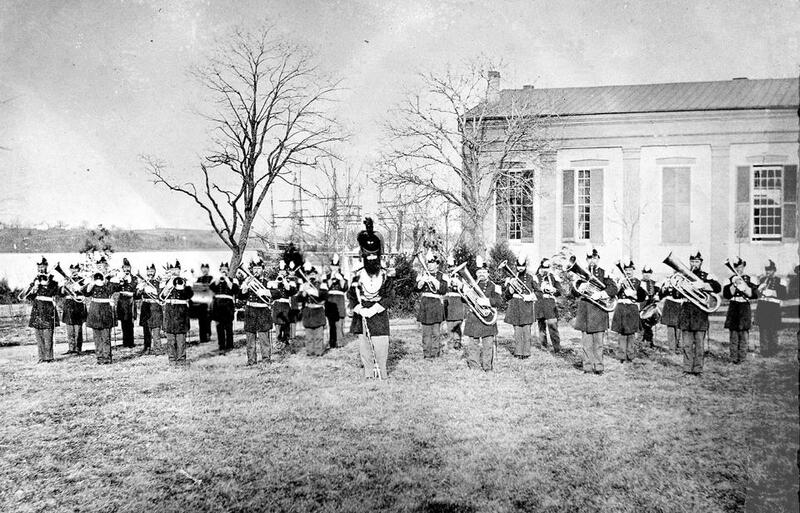 At the request of Commander Stribling, Superintendent USNA, one of the band's first performances occurred during the Secretary of the Navy's visit to the yard on October 29, 1853: "The band will be present to receive the Secretary of the Navy and will be ready to play when directed." On May 17, 1860, Secretary of the Navy increased the membership of the band to fourteen members. At the beginning of the Civil War, the upper class midshipmen were sent to sea, and the rest of the Naval Academy was transferred to Newport, Rhode Island. The remaining midshipmen sailed to Newport, Rhode Island on the USS CONSTELLATION. The faculty and staff (including the band members) were sent to Newport on the BALTIC. 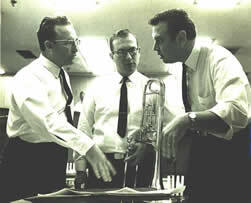 Soon after the band arrived in Newport, E-flat Cornetist Charles Hammer replaced Pfeifer as bandleader. Hammer served as leader for only three months and was replaced by G. J. Meyer. 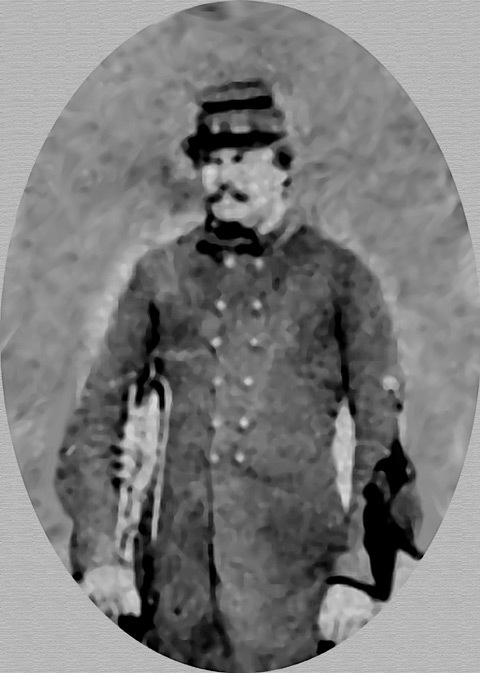 In 1863, William F. Marshall replaced Meyer and served until his enlistment expired in 1865. Under his leadership, the band membership increased to include fifteen members, all brass players. Marshall was the first bandleader not listed as an instrumentalist. 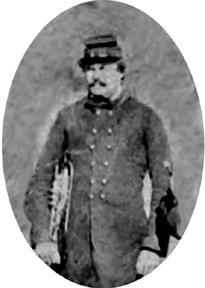 Peter Schoff, a former U.S. Calvary Master Sergeant who served as a bandmaster during the civil war, was hired to replace him. 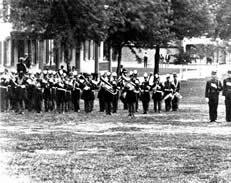 On July 1, 1865, Naval Academy Band members were transferred to the civil list of Academy personnel. 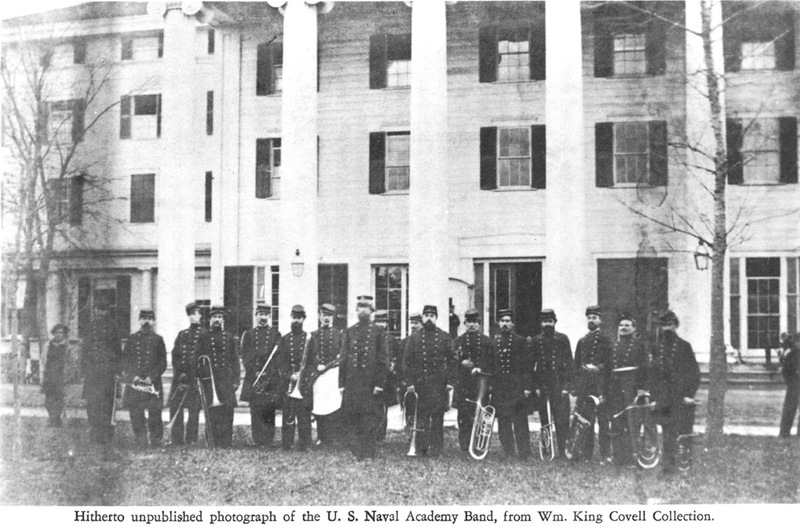 Band members were to be paid from the appropriated funds of the Academy instead of the regular pay of the Navy. The new "Rate of Pay" allowed $528.00 per year for the bandmaster, $346.00 per year for 1st class musicians and $300.00 per year for the 2nd class musicians. Band members who desired to leave the employment of the Academy were required to find their own replacements. Academy officials offered Bandmaster Schoff the same pay that he received in the U.S. Calvary; however, the bandmaster's authorized new "Rate of Pay" fell short each month by $36.00. To make up the shortfall in the appropriated money for the band, each midshipmen was assessed 50 cents per month and officers $1.00 each month. Any money left over after paying the bandmaster was divided up equally with all the band members including the bandmaster. The musicians referred to this extra pay as "hop money". In preparation for the transfer of the Academy back to Annapolis, Bandmaster Schoff was ordered by the Superintendent to box all the band music and equipment. 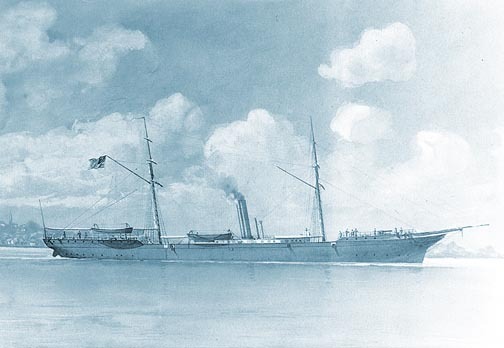 On August 7, 1865, the band boarded the USS Memphis with the Academy Staff, Faculty, and Superintendent, along with their families, and left for Annapolis. The "Memphis" arrived in Annapolis Harbor just three days later. With the Academy back in Annapolis, the new Superintendent, Vice Admiral David Dixon Porter, set about transforming every aspect of Academy life, including the band. 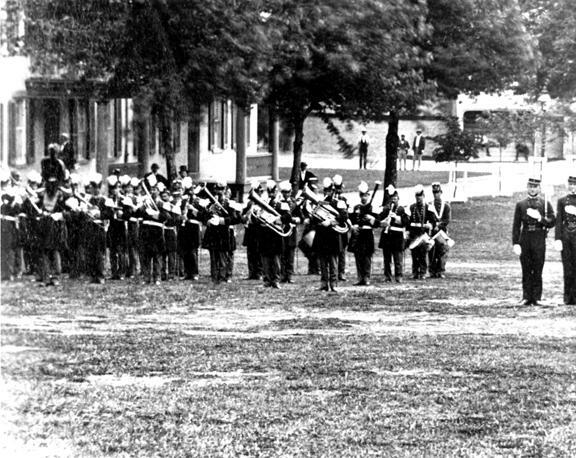 On October 14, 1865, Secretary of the Navy Gideon Wells wrote Superintendent Porter authorizing the Academy to increase the size of the band to include "twenty-two musicians, two snare drummers, one bass drummer, one cymbal player and one triangle player." Since its inception, uniforms for the band had been the standard dark blue union frock coat with fourteen buttons, light blue pants with union kepi hat. VADM Porter designed a new uniform for the band that added red facings, plumed hat, white epaulets, and a white leather sword belt with sword. Park Benjamin, Class of 1867, mentioned in his famous history of the Naval Academy what a grand impression the new band uniform had made with members of the brigade of midshipmen. "Even the band, which hitherto had been a small, dispirited collection of serious individuals attired in coats of ecclesiastical cut, turned up with dingy red, and which had a dreadful habit of inciting incipient mutiny by its insistence in playing some one tune, became under Porter's magic touch greatly increased in numbers, and, headed by a drum major, swung down before the line on parade in a way that aroused the delighted admiration of every youngster in the battalion." 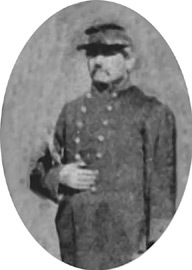 The drum major mentioned was Andrew Denver, called "Old Denver," who was appointed Watchman on August 22, 1856, and then promoted to "Captain of the Watch" on April 4, 1859. 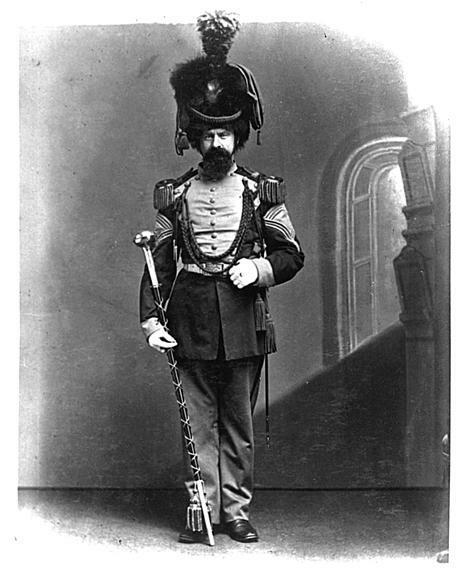 He also served as the band's drum major until the 1870's. The uniform that he wore was an impressive costume that was crowned with an enormous roped bearskin hat. Commodore John Worden became Superintendent on December 1, 1869, and the first Farewell Ball, Midshipmen Color Competition, Color Parade, and Color Girl Ceremony were all initiated during his tenure. 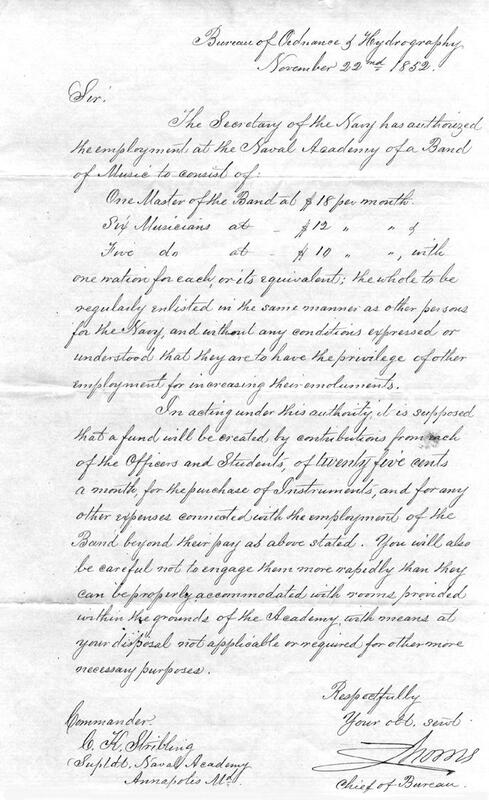 The Secretary of the Navy authorized a housing allowance of eight dollars per month for musicians not having quarters within the grounds of the academy on February 10, 1871. The frequency of hops and balls increased, as it was thought they had a very refining influence upon the young gentlemen. Much importance was also placed on military drill, and dress parades became a daily occurrence; even graduation exercises resembled a dress parade. This much activity around the yard created an interest in the institution and prompted quite a few visits from many prominent individuals from Washington D.C. and Baltimore. The exposure to influential people created an awareness and familiarity of the Academy and its resources. 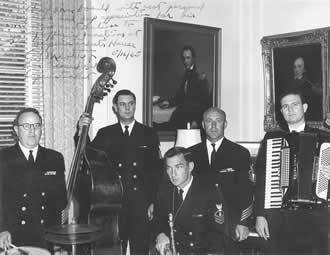 As the nation prepared to celebrate the centennial in Philadelphia, several members of congress contacted the Secretary of the Navy, George M. Robeson, to request a performance of the band from the Naval Academy. 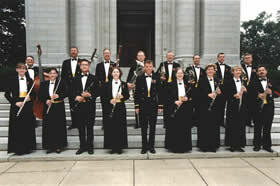 The band would accompany the Columbia Commandery No. 2 of the Knights Templar of Washington D.C. for a parade on May 30, 1876, in Philadelphia. 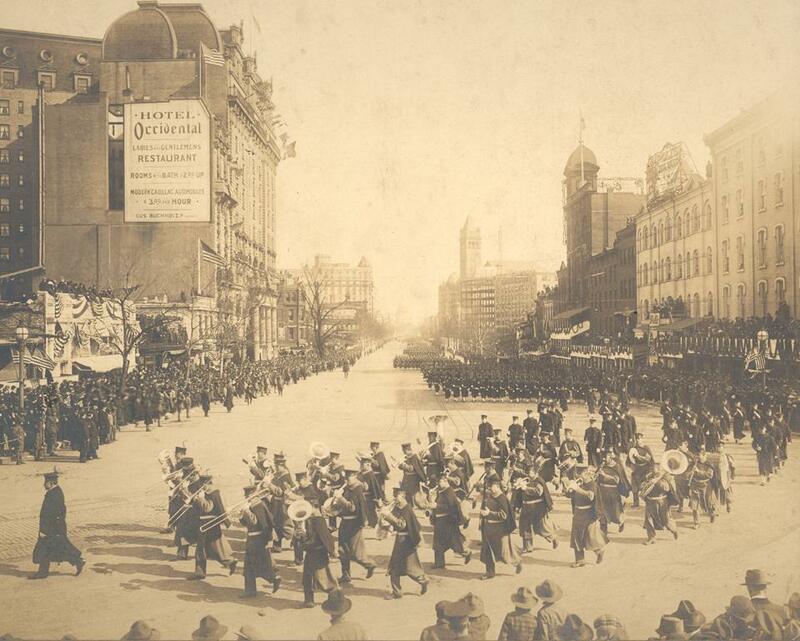 America's Centennial Exposition attracted over six million visitors, and the "Parade of the Knights Templar" drew over seven hundred participants, many bands, and thousands of visitors. 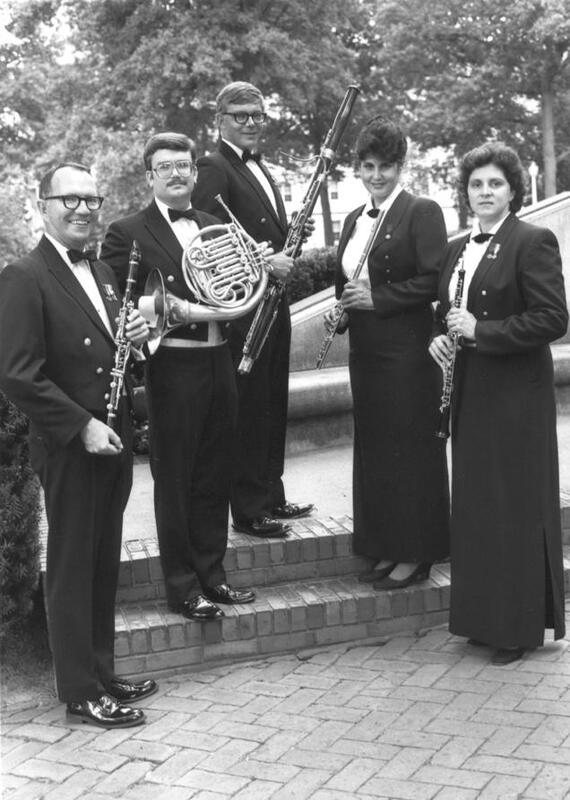 During this period, woodwind instrumentalists again performed with the band. 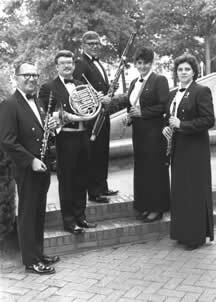 The piccolo, flute, oboe, E- flat clarinet, B-flat clarinet, saxophone, and bassoon all appeared, and by October 1883, the band included fifteen woodwinds. 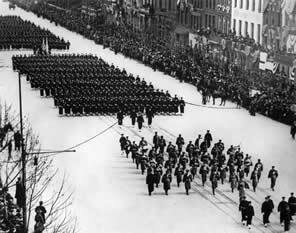 On March 4, 1881, the band accompanied the Brigade of Midshipmen to march in President Garfield's inaugural parade. 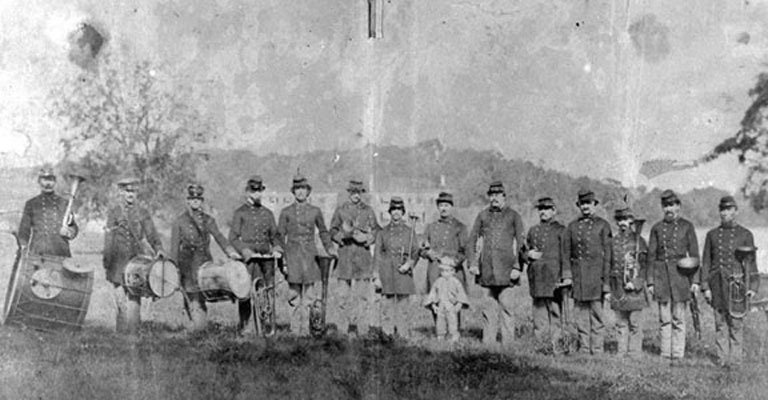 Four years later, the band returned to Washington D.C. to participate in the dedication ceremony of the Washington Monument on February 21, 1885. On March 4,1885, the band marched in Grover Cleveland's Inaugural Parade. Upon Peter Schoff's retirement on March 1, 1887, Charles Adams Zimmermann became the sixth bandmaster at the Naval Academy. At age 26, he is still the youngest person to become leader of the Naval Academy Band. Joining the band as a 3rd Cornetist on July 1, 1882, he also performed on the violin and cello. For three years prior to joining the Navy, he attended the Peabody Institute of Music in Baltimore (the city of his mother's birth), and is considered a distinguished graduate of that institution. 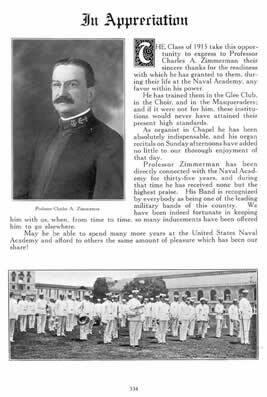 Zimmermann's father had been a band member since June 20, 1859, and Charles Zimmermann was born while the band was stationed with the Naval Academy in Newport, R.I. He was a musician of exceptional ability. Not only did he direct the band, but he also led the Midshipmen choir and started the Midshipmen theatrical club "The Masqueraders." Additionally, he played the organ at St. Mary's Catholic Church in Annapolis. 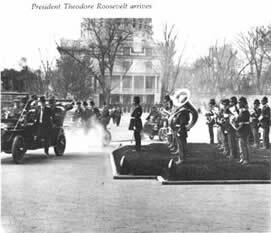 Above is a silent movie clip of Theodore Roosevelt's inauguration on March 4, 1905 in Washington, D.C., with the Band and Brigade of Midshipmen. During his career, he dedicated a march for many of the graduating classes at the Academy. 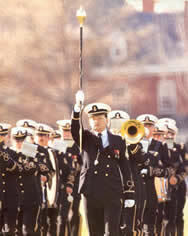 His work with the Midshipmen was so much appreciated that the class of 1889 presented him with a gold and ebony baton. 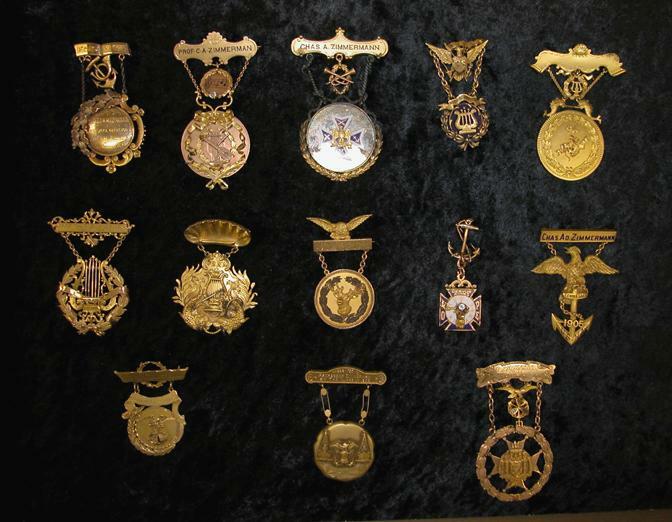 Following their lead, the classes of 1892, 1893, 1894, 1895, 1896, 1897, 1899, 1901, 1902, 1905, 1908, 1909, and 1911 each presented him with a gold medal. He led the band in many performances on the Academy grounds and toured with the band up and down the Eastern Seaboard, including performances at the Willow Grove Park (1904), Princeton University, Maryland Agricultural College, Deer Park Hotel, Oakland Hotel, Pen-Mar Resort, Cape May Resort, and the Natural Bridge Resort. Conducting a 120-piece dance orchestra for the Grover Cleveland Inaugural Ball (March 4, 1893) in the Pension Building in Washington, D.C. gained Zimmermann national recognition. 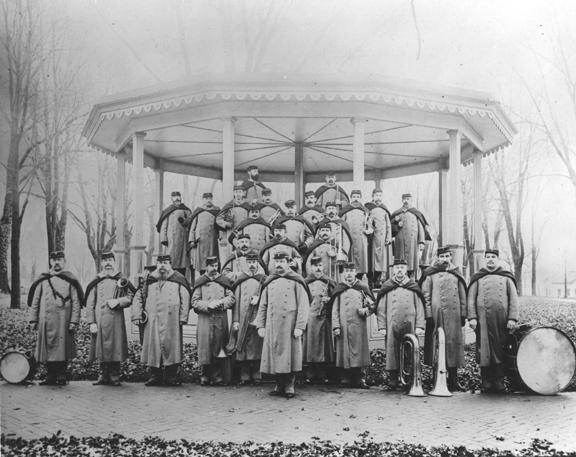 The following year, in 1894, an order was issued prescribing the scarlet coat, blue pants, and spiked helmet of the standard Marine Corps uniform for all Navy Musicians, including the Naval Academy Band. 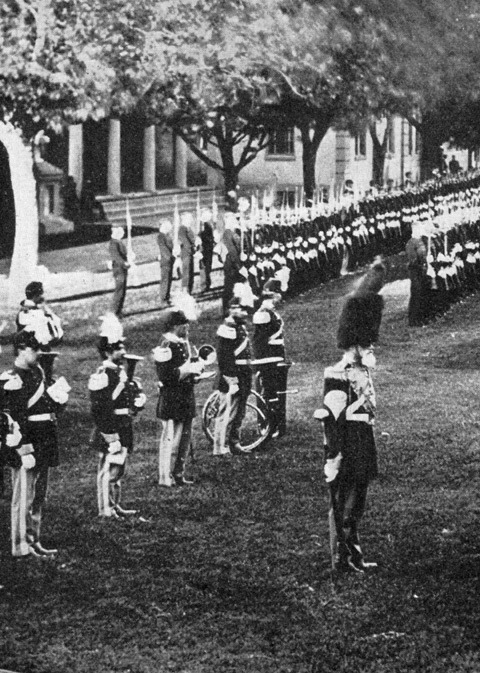 By 1898, Fleet Navy Bands had done away with the high-maintenance but impressive Marine Uniform, but the Naval Academy Band continued to wear it until 1925. When bandmaster Francesco Fanciulli of the US Marine Band, Washington, D.C., was dismissed in 1897, Zimmermann was offered the prestigious position. 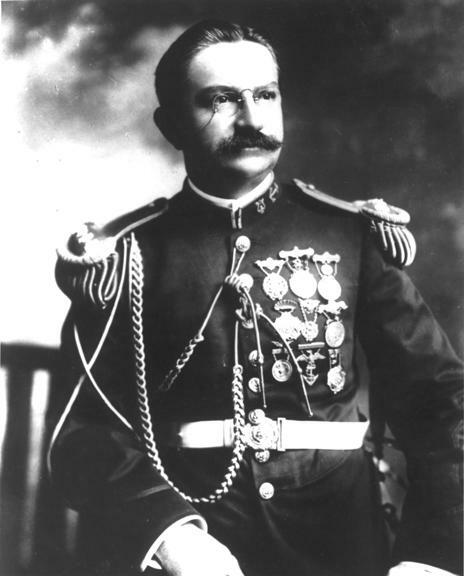 Both Colonel Charles Heywood, Commandant of the Marine Corps, and Theodore Roosevelt, Assistant Secretary of the Navy, worked to bring Zimmermann to Washington, D.C. The event was a major news story for the Washington Post during that year, and in the end, Zimmermann declined the position and remained in Annapolis. 1903 marked the closure of the U.S. Navy School of Music in Norfolk, Virginia, and seventeen active duty Navy Musicians from the school were transferred to the Naval Academy to augment the Naval Academy Band, including Bandmaster Pasqual DeSantis. For seven years, Zimmermann had to mold this mixture of civilian and regular navy personnel into a cohesive unit, while administering a dual set of standards in areas such as outside employment, disciplinary action, retirement and medical benefits. 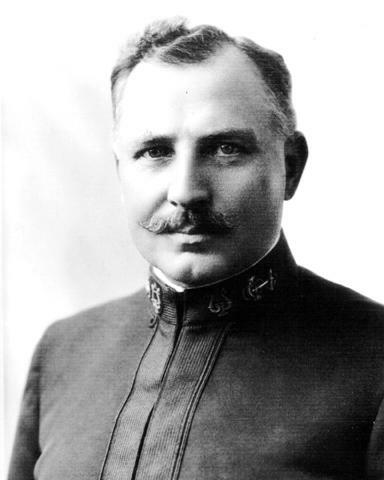 Midshipman First Class Alfred Hart Miles approached Zimmermann with a request for a new march. 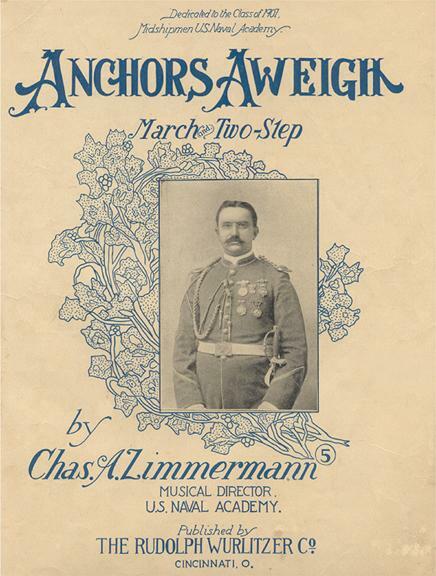 Miles, a member of the Midshipmen Choir and the Class of 1907, told Zimmermann that he and his classmates "were eager to have a piece of music that would be inspiring, one with a swing to it so that it could be used as a football marching song, and one that would live forever." Supposedly, with the two men seated at the chapel organ, Zimmermann composed the tune and Miles set the title and wrote two stanzas. This march was played by the band and sung by the brigade at the 1906 Army-Navy football game, and for the first time since 1900, Navy won. 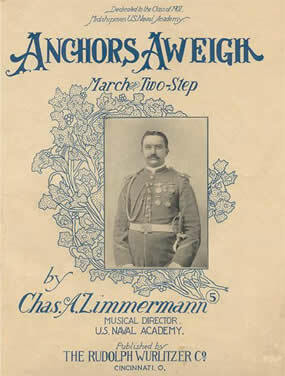 This march was "Anchors Aweigh," which was subsequently dedicated to the class of 1907 and is widely accepted as the song of the U.S. Navy. Click to read more about "Anchors Aweigh." 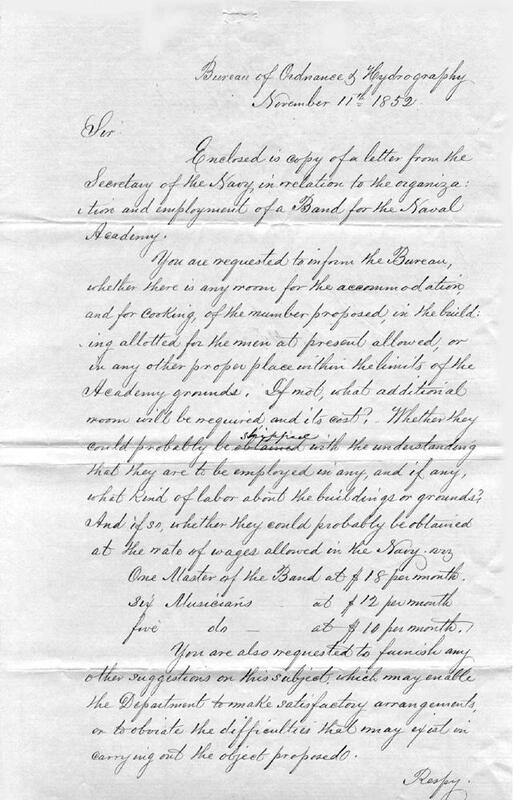 "Be it enacted by the Senate and House of Representatives of the United States of America in Congress assembled, The Naval Academy Band shall consist of one leader, who shall have the pay and allowances of a second lieutenant in the Marine Corps; one second leader, with the rate of fifty dollars per month, twenty-nine musicians, first class, and eleven musicians, second class; and shall be paid from "Pay of the Navy." "Sec. 2. 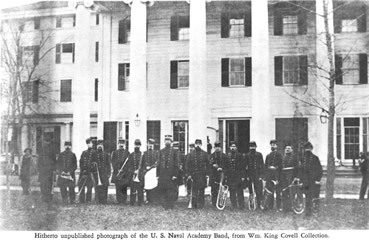 That the members of the Naval Academy Band as now organized shall be enlisted in the navy and credited with all prior service of whatever nature as members of said band, as shown by the records of the Naval Academy and the pay rolls of the ships and academy; and the said leader and the enlisted musicians of the band shall be entitled to the same benefits in respect to pay, emoluments, service as are, or may hereafter become, applicable to other enlisted men of the navy: Provided, that no back pay shall be allowed to the leader or to any member of said band by reason of the passage of this act." The midshipmen prepared a special tribute in the 1916 Lucky Bag (year book), recognizing Zimmermann's years of devotion to the Naval Academy, which unfortunately he never had opportunity to read. Zimmermann fell ill during the latter part of 1915 and took sick leave to fully recover. Upon his return to duty, he suffered a brain hemorrhage and passed away at the Naval Hospital on January 16, 1916. He was given a full military funeral with midshipmen serving as pallbearers. Classes were suspended so that the entire brigade could attend. His body was first interned at St. Mary's Cemetery and later was exhumed and transferred to the Naval Academy Cemetery, where a handsome granite monument was "Erected by His Midshipmen Friends." After Zimmermann's untimely death, his assistant leader, Adolph Torovsky became the bandleader. Torovsky had joined the band as a Cornetist on January 4, 1892, and had quickly risen to a position as the band's first assistant leader. Born in Bohemia in January 21, 1868, he went to Vienna for seven years as a member of the 26th Hungarian Regiment Band, playing the cornet, violin and cello. In Vienna, he studied with several prominent musicians including Johann Strauss Jr. When his enlistment expired in 1891, he traveled to America and joined the Naval Academy Band. Like his predecessor, Torovsky was an accomplished composer. His compositions include "Memories" for the Class of 1918, "Underway", "Navy Blue and Gold" (not the same as the USNA Alma Mater), "Triumphal March", "Our Boys Overseas", "Woodland Whispers"," The Army and the Navy" and "March of the Middies". In 1913, he had become conductor of the St. John's College band; in that position, he composed the school songs "St. John's Forever" and "Faculty March". "One leader, to be a first lieutenant in the Marine Corps; one assistant leader; one drum major; 45 musicians first class and 27 musicians second class". Torovsky and the band made the band's first commercial recording on June 9, 1920. The record was released by Columbia Gramophone Company with Zimmermann's "Anchors Aweigh" and Torovsky's own "March of the Middies." The following year he retired from the naval service. Adolph Torovsky was replaced by H.J. Peterman, a Navy bandmaster from Washington, D.C. By 1925, the spiked helmeted uniform had become outdated, and a new uniform was designed that was dark blue with six gold braids down the front with red facings. The new uniforms were similar in design with the U.S. Marine Band, except the colors were exchanged. 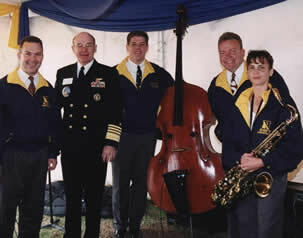 This uniform was supplemented the following year by a Navy Chief's style uniform, similar to the current uniforms worn by the band today. 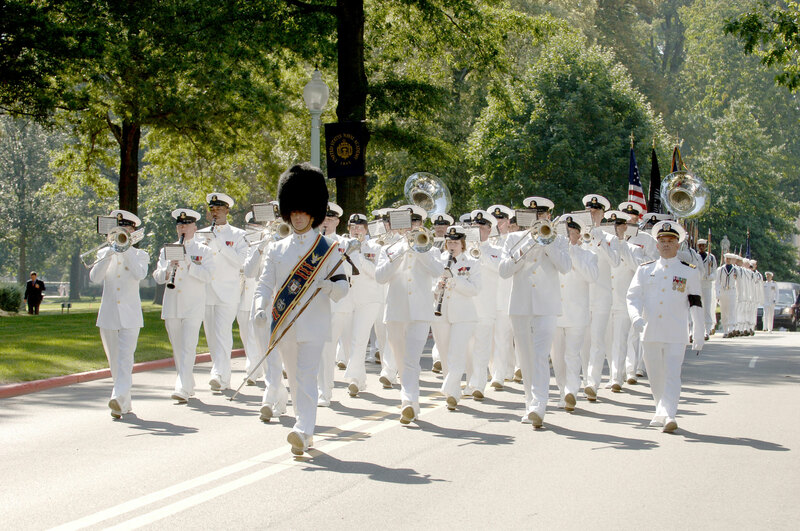 In these uniforms, Midshipmen began referring to the Naval Academy Band as "The Chief's Band," a tradition that still lasts today. In 1931, legislation sponsored by the Honorable Stephen W. Gambrill, Representative from Maryland's Fifth Congressional District, was passed, and resolved differences in the administration of the U.S. Navy Band and the Naval Academy Band. 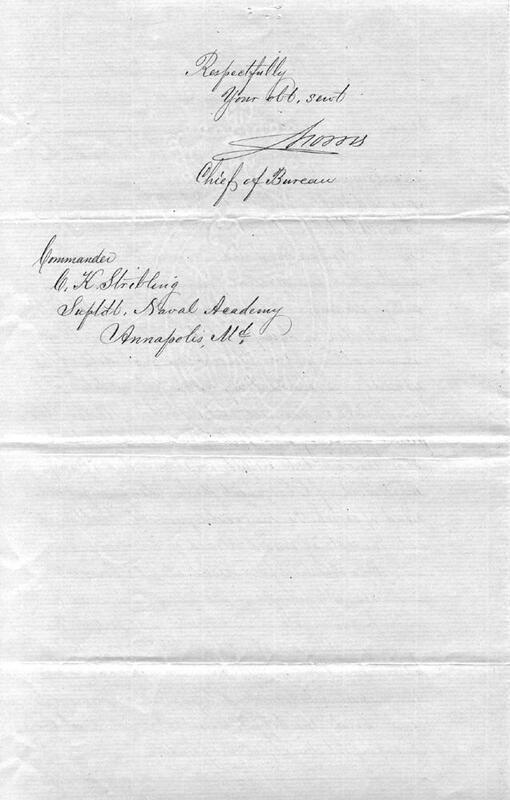 This amendment provided that the U. S. Naval Academy Band would be comprised of one leader with the pay, allowances, and uniform of a Lieutenant, U. S. Navy; one assistant leader with the pay, allowances, and uniform of a warrant officer, and also raised the membership of the band to include 76 musicians. When Lieutenant Peterman retired in 1932, his assistant director, William Sima, succeeded him. Lieutenant William Sima, best remembered as the composer of the Academy's "Victory March," joined the band at age 18 in 1910. Born in Baltimore, he attended City College and became musical director of the Wilson Theatre at age 15. 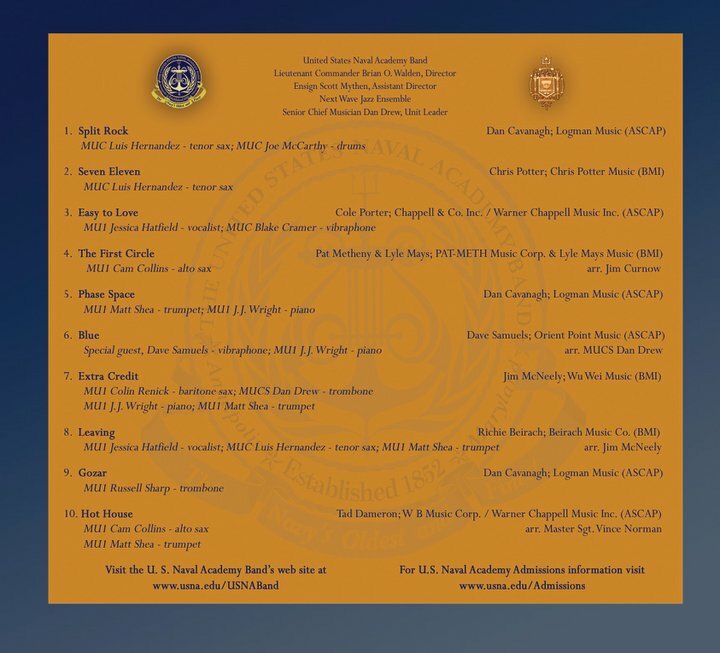 As the Naval Academy Bandleader, he is credited with several musical compositions, including the musical score to the midshipmen productions of "Gangway" and "Cease Firing." In the summer of 1918, he played with Victor Herbert in the "Red Mill" and at the premiere performance at Ford's Theater of "Naughty Marietta." 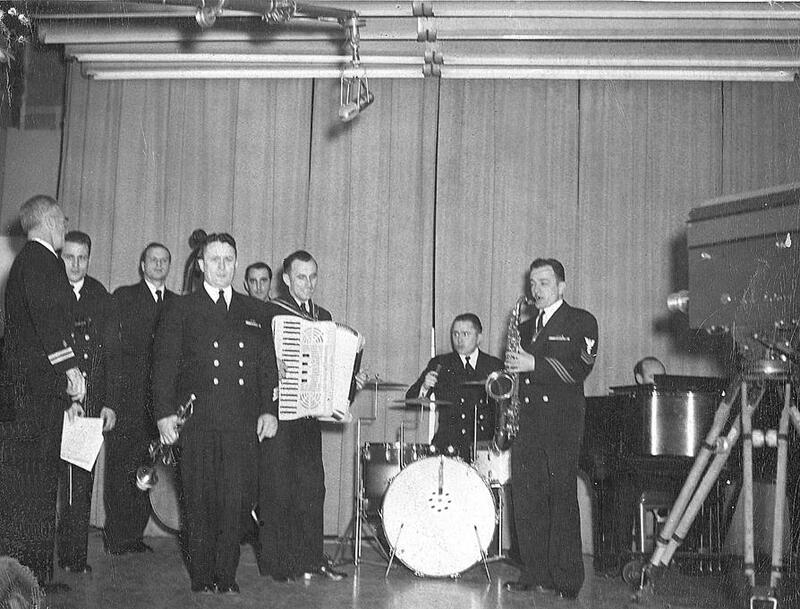 In the summer of 1933, twenty members of the band, including Sima, participated in a midshipmen practice cruise. Somewhere in mid-ocean between the Madeira Islands and Halifax, LT Sima and Midshipmen Collins and Martin wrote the words to the "Victory March" in about fifteen minutes. 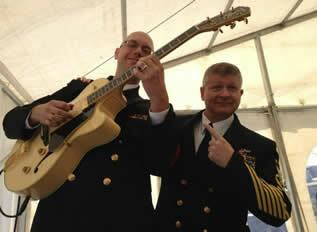 A day or so later he completed a musical arrangement and introduced the song to the Brigade of Midshipmen. It was met with overwhelming approval by the Brigade. The song is performed at most Navy sporting events to this day. Drum Major Otts Jerosik with the trombones. Probably circa 1940. In 1939, the band began broadcasting performances over local Maryland radio stations and also traveled to New York City to represent the State of Maryland at the 1939 World's Fair. Congress again increased the size of the band to 78 members: one leader, pay and allowances of senior lieutenant, U.S. Navy; one assistant leader with pay and allowances of a warrant officer, 14 musicians with pay and allowances of permanent chief petty officer, 19 musicians with pay of acting chief petty officer; 22 musicians with pay of 1st class musician; and 22 musicians with pay of 2nd class petty officer. 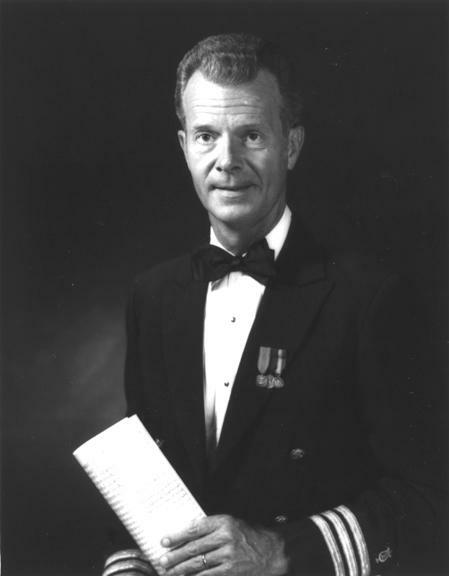 Alexander Cecil Morris, a career Navy Musician, became leader of the band in 1946. Born in Manhattan's East Village on January 21, 1889, he was orphaned at age three and grew up at the St. Vincent's School for Boys in New York City. He enlisted in the U.S. Navy on November 17, 1907, and served on board the training ship USS Constellation. Eighteen years later, he was selected to be "third leader" at the newly formed U.S. Navy Band in Washington D.C., and also held the position as bandleader on board the Presidential Yacht "MAYFLOWER," serving Presidents Warren Harding, Calvin Coolidge, Herbert Hoover, and Franklin Roosevelt. In 1931, he was promoted to "second leader" at the U.S. Navy Band. 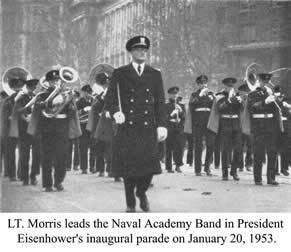 He transferred to the Naval Academy Band as second leader in 1938.
Notable events during his tenure include the beginning of a weekly radio show, President Eisenhower's inaugural parade, the band's first performance on television, and marching in the WWII Victory Parade, as well as inaugurating the annual tradition of a combined performance of Handel's "Messiah" in the Naval Academy Chapel with the chorus from Hood College. In 1953, Congress amended the law governing the Naval Academy Band to permit the Secretary of the Navy to prescribe the grade of the leader. Lieutenant Morris received promotion to Lieutenant Commander. Congress also established that the proportionate distribution among the ratings of the enlisted men would be the same as in the U.S. Navy Band, Washington, D.C. 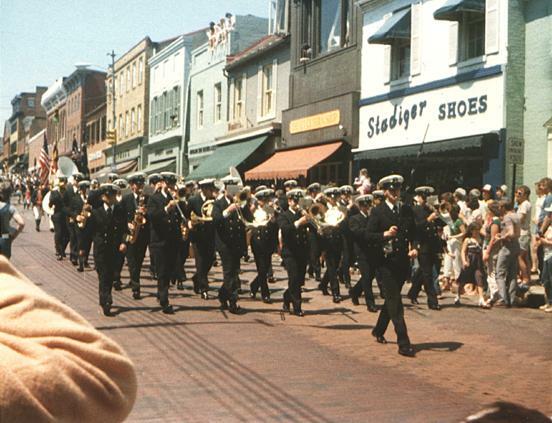 In August 1954, at the request of the Superintendent, a board of officers selected by the Chief of Naval Personnel conducted an inspection of the Naval Academy Band. This board's report covered every facet of the Band's operation, and recommendations were made to increase the size of the band and provide adequate facilities, musical instruments, and equipment. 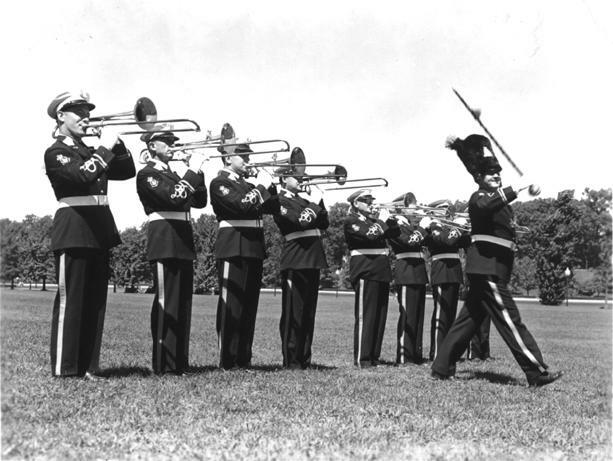 In March of 1955, nearly all of the band's instruments and equipment were replaced. The value of this material was $35,000, but a majority came from surplus stocks on hand which were purchased in anticipation of a large expansion for the Korean War. Additional space was acquired to expand the music library and office space needed for increased administrative requirements. 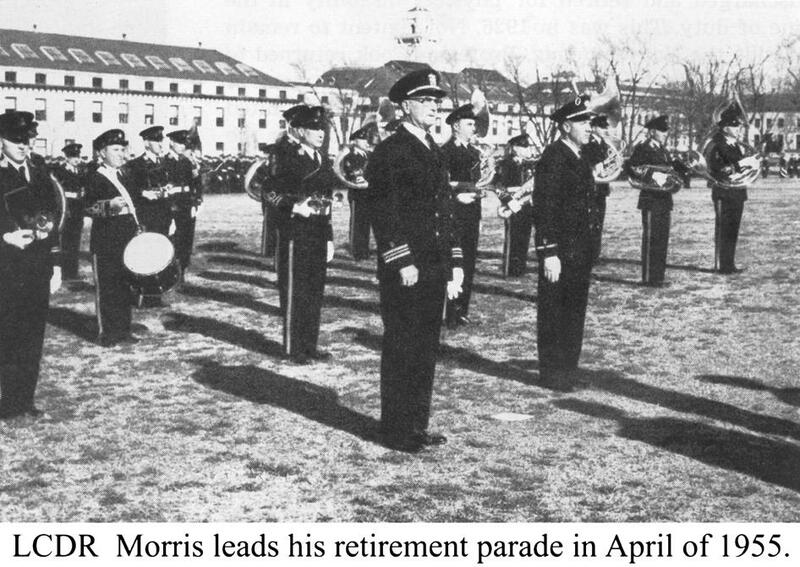 Mr. Morris retired in March 1955 after 47 years and five months of continuous service, and was the first Band Leader to be honored by the Naval Academy as the Reviewing Officer at a Dress Parade, as well as by the State of Maryland with Senate Resolution No. 42, congratulating and commending him for his services to the state and the Navy. 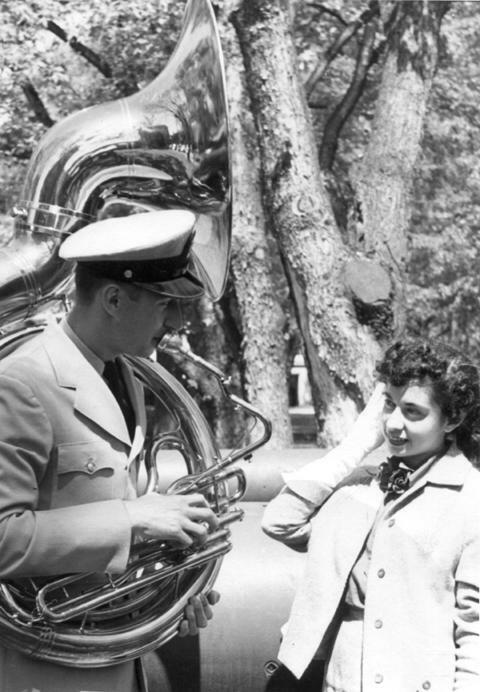 Tubist Basil Kapchonick serenades a young lady on his sousaphone, and she is obviously impressed! 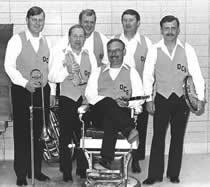 In April 1955 Max Corrick became the 11th Leader of the band. Born in Boone, Iowa in 1919, he enlisted in the Navy in 1939 and served as instrumentalist and assistant leader in the Pacific area until 1943. He also served as Leader of a Navy Unit Band and as an instructor at the U.S. Naval School of Music. Mr. Corrick was transferred to the U.S. 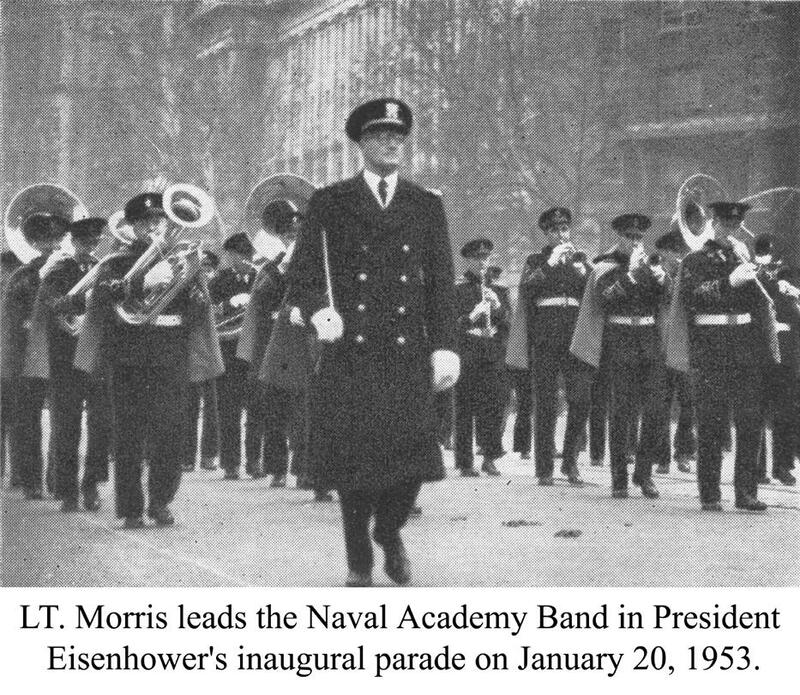 Naval Academy Band in 1954 and after his appointment as Leader, was promoted to Lieutenant Commander in October 1957. 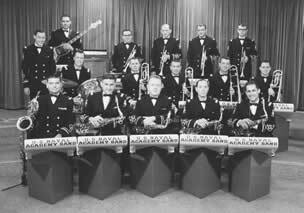 The personnel allowance of the band was increased to 85 in May 1955. 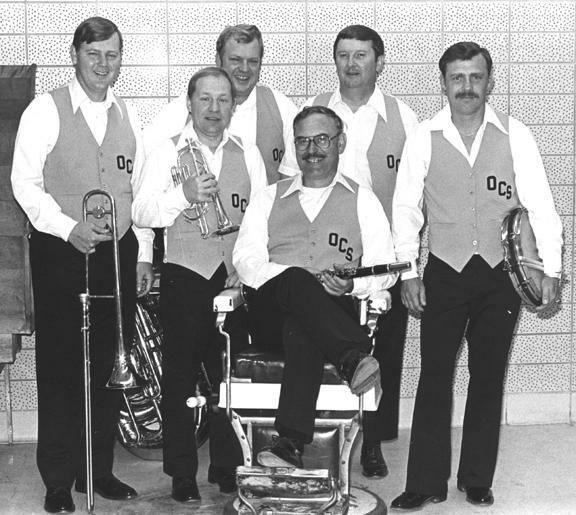 Many great performers joined the band during this time including trumpeter, Don Tison, pictured above with fellow trumpeters R.C. Kitt and J.G. Eldred. Tison went on to be Principal Trumpet in the Baltimore Symphony Orchestra for 31 years. A uniform for ceremonial occasions and dress parades was redesigned and delivered in September 1955. 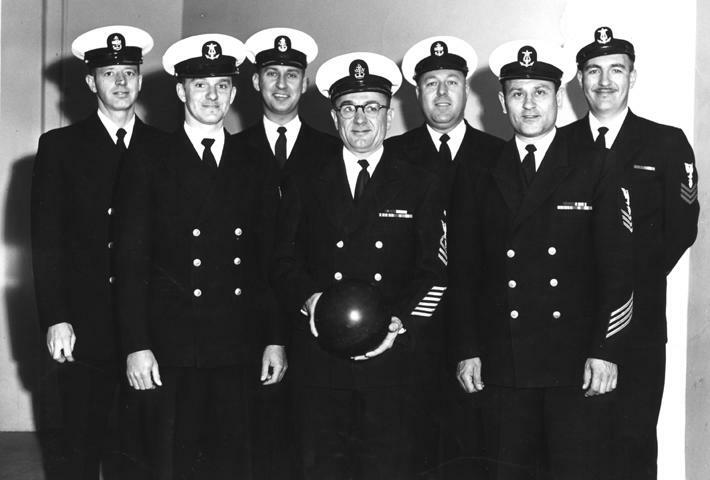 1961 Severn River Naval Command (SRNC) Bowling Champions. The much needed band facilities improvement lagged far behind the actual needs of the band as noted in the 1954 Inspection Report. Many proposals had been advanced concerning spaces for the band, and nearly every available building in the U. S. Naval Academy was surveyed and studied as a possible site. In 1961, it was decided that the band would remain in Bancroft Hall and designs were submitted to use the area below the 2nd and 4th wing terraces. The total area occupied by the band increased from 5,130 square feet to 7,900 square feet. This is the same space currently occupied by the band. Harper's Bazaar magazine sent three fashion models to the Naval Academy for publicity photos in 1963. This is on the steps to Zimmermann Bandstand. 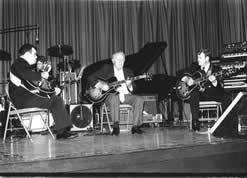 (L-R) John Humphries, Cy Harris, and Rex North. Cy commented "It was a tough job, but somebody had to do it!" 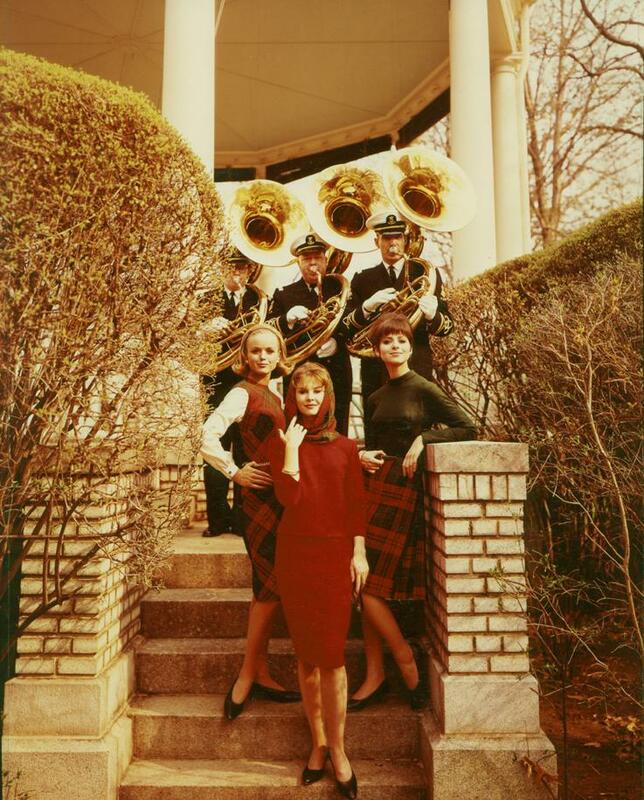 In 1963 the USNA Band Wives Club began offering a one-semester scholarship to Peabody Preparatory School. The scholarship plus an opportunity to solo with the Naval Academy Band was awarded to the winner of a formal audition held at Annapolis Junior High. The first winner was Ralph M. Gambone, eventually the 23rd Leader of the band. Mr. Corrick died in December of 1965 while serving as Leader of the band, and is buried in the Naval Academy Cemetery. 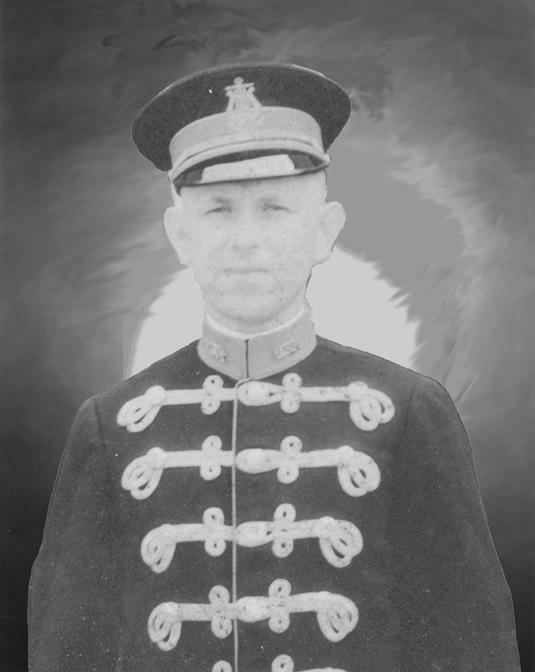 Upon Bandmaster Corrick's death in 1965, the policy governing assignment of band officers to the Naval Academy Band was changed. Officers would no longer be assigned on a permanent duty, non-rotational status. It was felt that the influence of "Fleet Leadership" would be beneficial to the organization. Since 1966, leadership of the band has been determined by the Bureau of Naval Personnel. In the first 113 years of the band, only 11 different men were assigned as leaders. It took only 27 years to get 11 more. The Superintendent's Combo, May 16, 1965. Ralph MacDonald, Bill Meyers, Jim Jenkins, Fred Magliano, and Jack Marcheski. The inscription reads; "To Chief MacDonald with best personal regards and deep appreciation for his musical contributions to many official functions at the Superintendent's House." Signed, C.S. 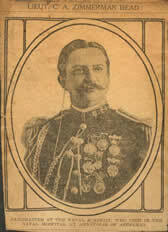 Minter, Rear Admiral, Superintendent. 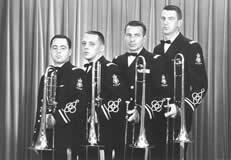 Preston Turner, a cornetist, began his musical career in Dallas, Texas and concluded as the 12th Leader of the Naval Academy Band from 1966 to 1968. His Naval career included duty with bands aboard the U.S.S. Texas, U.S.S. New York, U.S.S. Kearsarge, and the U.S.S. Franklin D. Roosevelt, instructor duty at the School of Music, West Coast Audition Supervisor, and Leader or Assistant Leader of various Navy Bands, including Assistant Leader of the U.S. Navy Band, Washington, DC. 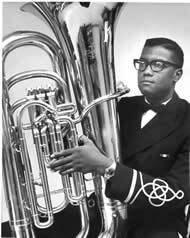 Tom Short, the first African-American member of the USNA Band, joined the Navy's Oldest and Finest in 1967 as a tuba instrumentalist. 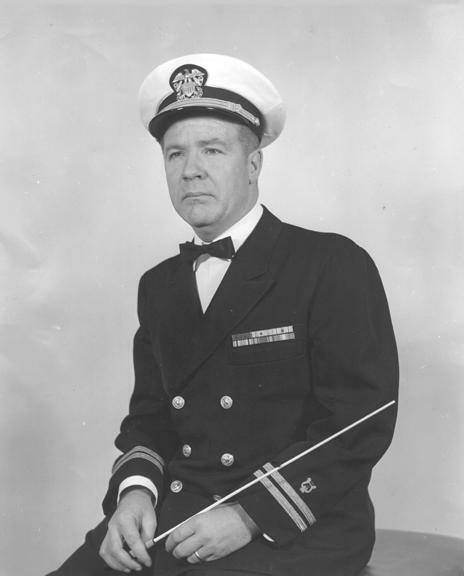 Following Lieutenant Commander Turner was John S. Surber, a trombonist with the USNA Band from 1955 to 1960. A native of Peru, Indiana, he graduated from high school in that city and attended Indiana University before enlisting in the Navy in August 1948. During the next several years, he served in unit bands in Yokosuka, Japan, Great Lakes, Illinois, and Commander, Cruiser Division One, home ported in Long Beach, California. 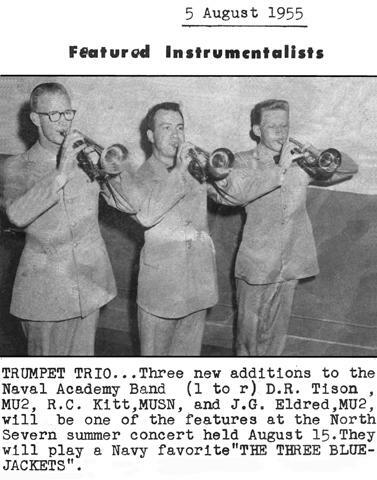 In 1955 he was accepted as a trombonist with the United States Naval Academy Band, and remained here until 1960, when he received his commission. Among his duties were leader of the Navy's select Choral group, the Sea Chanters, at the U.S. Navy Band in Washington, DC, Executive Officer of the School of Music, and in May 1968, he returned to the Naval Academy Band as Assistant Leader. He was appointed Leader of the band and promoted to Lieutenant Commander in March 1969. He was assigned as Commanding Officer, School of Music, in 1971, where he remained until his retirement in 1972. He was the first enlisted member to transfer out of the USNA Band, receive a commission and return to Annapolis as Leader. Donald Dean Patterson, a native of Ventura, CA, attended Hartnell College, in Salinas, CA, and enlisted in the Navy in 1945, attending the Navy School of Music, Washington, DC, before being assigned as trombone instrumentalist to the PACFLT band aboard the USS Wasp. Mr. Patterson was assigned to the Entertainment Branch, New York, and rehearsed for a show tour to the Far East with a special show band. He also served with bands on the USS St. Paul, USS Astoria, USS Pasadena, USS Springfield, ComCruDiv 5, and Naval Operations Base, Kodiak, AK. In 1954, he transferred to Seattle, where he was head arranger for the Seattle TV series, "March- On," which won two Peabody Awards as the best show of its kind in the country. He served at the Navy School of Music, Washington, DC, Band 161 at Naval Base Brooklyn, NY, and ComNavAirLant, in Norfolk, VA. 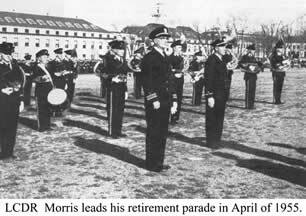 He was promoted to Lieutenant Commander in 1968 and served as Assistant Leader of the Naval Academy Band until 1970 when he assumed duties as Head, Music Branch at the Bureau of Naval Personnel. 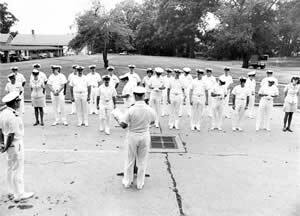 He became the 14th Leader of the Naval Academy Band later in 1970, a position he held for only a year. 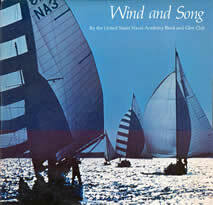 In that time however, the band recorded an album titled Wind and Song with the Naval Academy Glee Club. Ned E. Muffley was the Band's 15th Leader, serving in 1971 and 1972. His musical career as cornet soloist began in Allentown, PA at the age of seven. Mr. Muffley enlisted in the Navy in 1949 and after completing the basic course at the Navy's School of Music in Washington, DC, was assigned to a unit band in Kodiak, Alaska. During this period, he played first chair trumpet for a touring production of "South Pacific" entertaining the people in the Aleutians and Alaska. In 1955, he returned to the School of Music for the Advanced Course of instruction. 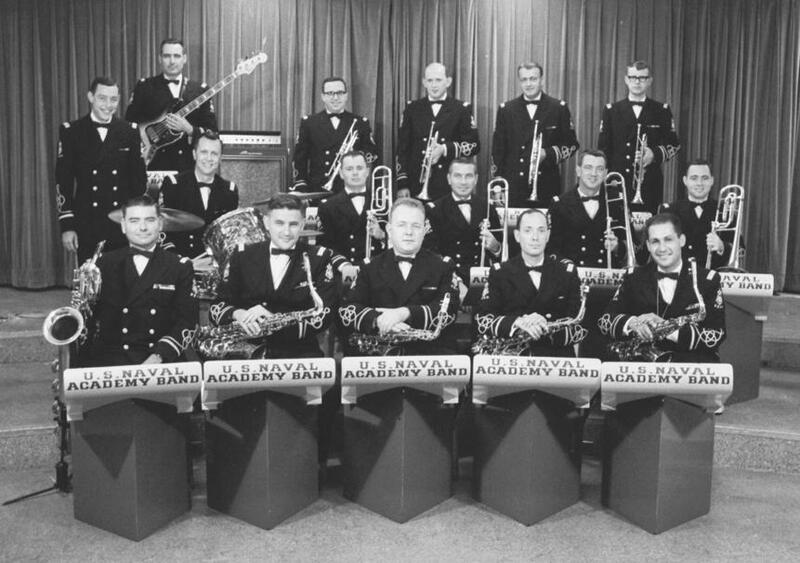 His classes were temporarily interrupted when he was selected to tour nationwide with the Ed Sullivan "All Navy Talent Show" as Trumpet Soloist with the band. Upon his return to the School, he completed the Advanced Course and was retained on the faculty as rehearsal conductor. After tours in the fleet, School of Music, and the Music Branch, he was commissioned an Ensign in 1965. In 1970, he was again transferred to the Bureau of Naval Personnel as the assistant head of the Music branch of the U.S. Navy. 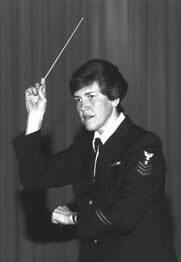 In 1971 he became head of this branch and guided the entire Navy Music program into accepting women into the Navy Music Community. The Next Wave in performance at a Pittsburgh Steelers home game in 1972. If they look cold, it may be because it was 18 degrees below zero that day! Brrrrr! During Muffley's tenure with the band the concert schedule was nearly tripled when he began a series of "total entertainment" concerts which included operas, plays, shows, and thematic concerts. Soloists from the band were encouraged to perform as well as renowned artists including jazz pianists Monty Alexander and Marian McPartland. In addition, Tidal Wave, USNA Band's first rock combo, and the Navy's first rock group to go on national tour, was formed. Tidal Wave, the newly formed rock band, in 1972. 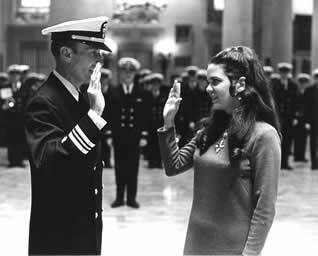 On December 8, 1972, Lieutenant Commander Muffley swore in the Navy's first official female instrumentalist, Heidi R. Hunter, of Reisterstown, MD. The soon to be Musician 2nd Class Hunter, a guitarist assigned to the Naval Academy Band, enlisted under a special program designed to attract women instrumentalists into the Navy Music Program. 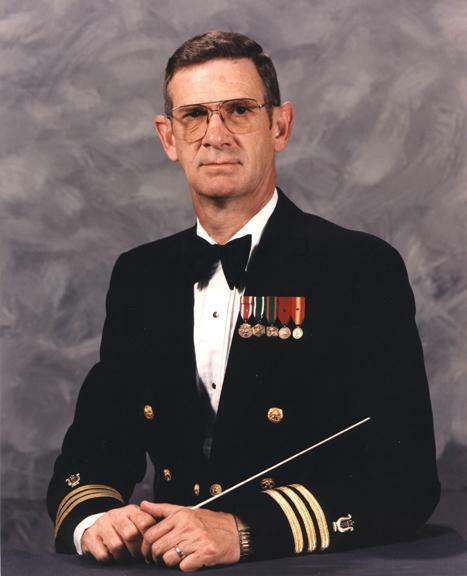 Mr. Muffley went on to serve as leader of the U. S. Navy Band in Washington, DC, and retired in December 1978 after serving in the Navy for 30 years. William J. 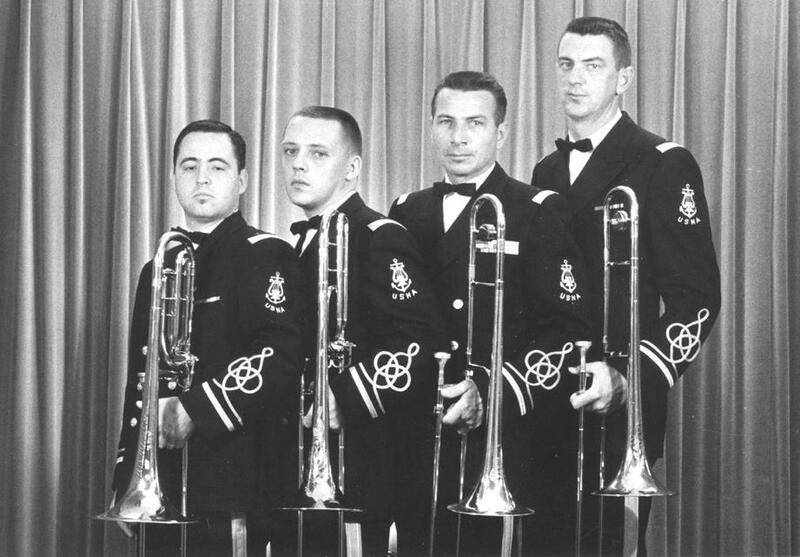 "Joe" Phillips, a native of North Carolina, enlisted in the Navy as a trombone instrumentalist in 1957 and reported to the School of Music at Naval Station Anacostia. He served with Navy bands at sea and ashore working his way up the ranks. 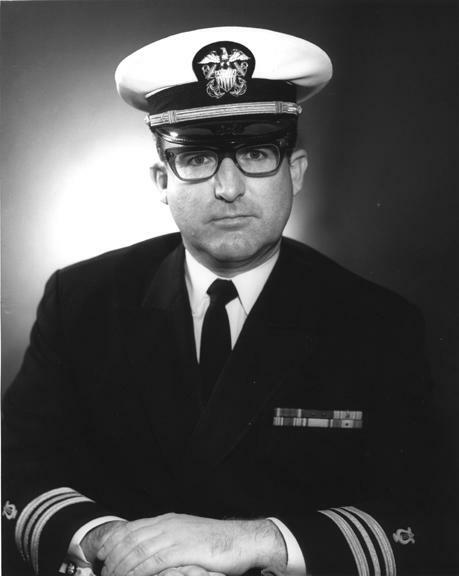 He was advanced to Chief Petty Officer in 1964, promoted to Warrant Officer in 1967 and became the leader of the Commander in Chief Atlantic Fleet Band in 1968. He was commissioned a CWO2 in 1969 and shortly thereafter was promoted to Ensign and reported to the U.S. Naval Academy Band as Assistant Leader. In March of 1972 he became the leader. 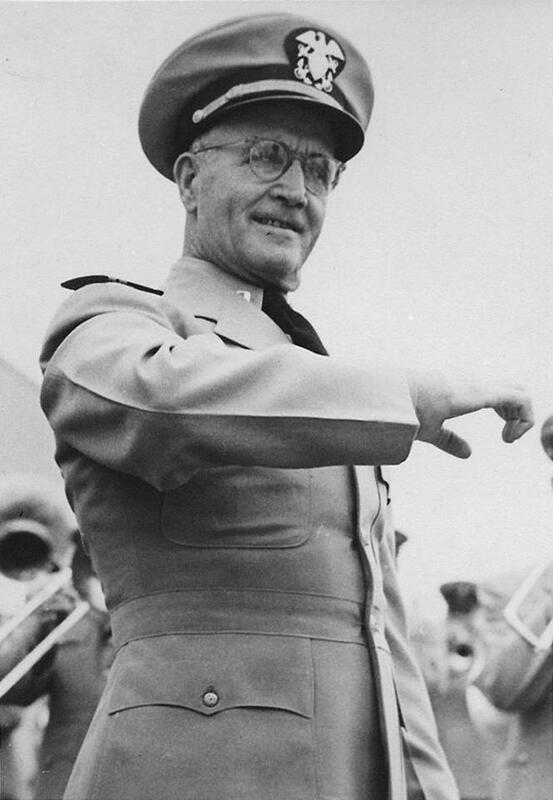 As leader of the Academy Band, Mr. Phillips proposed to revamp the image of the United States Academy Band and initiated a concept in programming that was new to the band and a departure from its traditional performances and repertoire. Academy Band concerts were totally thematic, complete with scripts and narration using a fifty-five piece band instrumentally capable of any sound from the classics to a lush, studio recording sound. and Bandmaster Joe Phillips, was recruited in 1973. 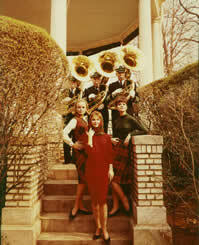 Known as "The Naval Academy's First Lady of Song," she had a highly successful 20-year career with the band. A staff of arrangers and copyists labored endlessly to provide new arrangements, making the programs about 85% original, and vocalists were featured to hold audience interest. This concept increased the Band's popularity and resulted in overflow crowds and the expansion of the band's concert schedule to include open-air concerts at the North Severn Naval Station during the summer, and the need to perform their indoor concerts twice weekly. 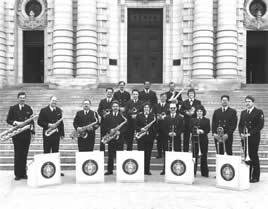 In January of 1974, the band's strength was officially cut from 88 musicians to 64, a move that coincided with many economizing measures in the Navy. 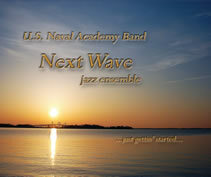 Navy Music was reconfigured at this time, eliminating Unit bands and creating larger regional bands. 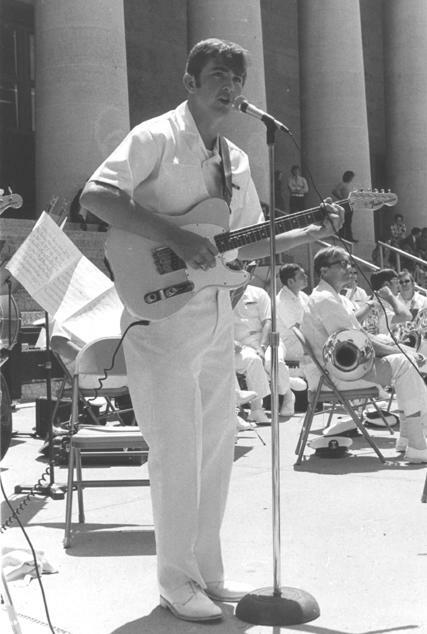 In June of 1974, the rank of E-6 (Musician 1st Class) became entry level for all new members of the Naval Academy Band, School of Music and US Navy Band to provide equity with members of the Special Bands in the other services. 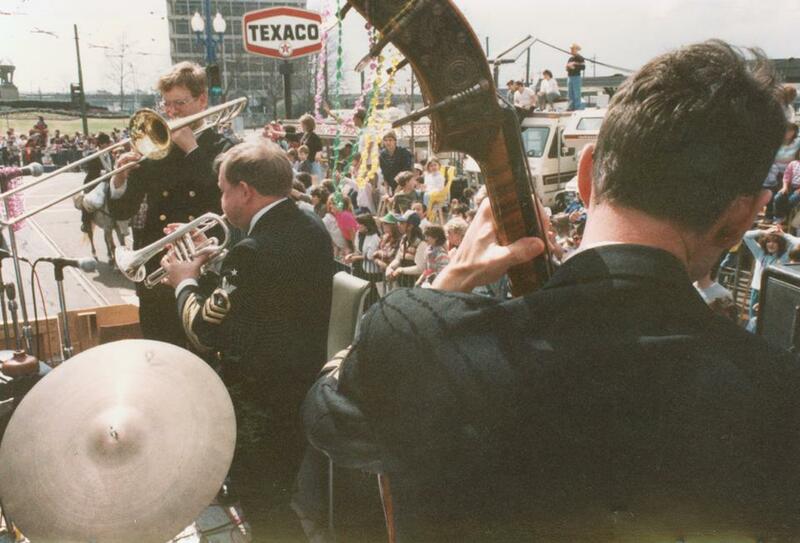 There was a new push on touring in support of the "all volunteer force," and all of Navy Music was put at the disposal of the Navy Recruiting Command. 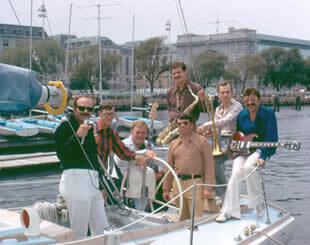 The bulk of the Naval Academy Band's touring was done by the rock band "Tidal Wave." 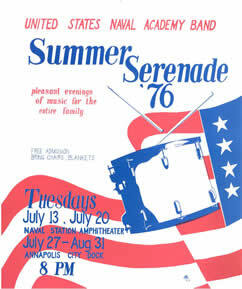 In 1975 consideration was give to the consolidation of the US Navy Band and USNA Band. The Band enjoyed a great reputation at the time and the plan was met with serious resistance from the community, with letters written to the Superintendent of the Naval Academy, members of Congress and the newspaper. The band was invited to march along with 90 midshipmen in a Bicentennial celebration parade in Massachusetts, with President Gerald R. Ford in attendance. 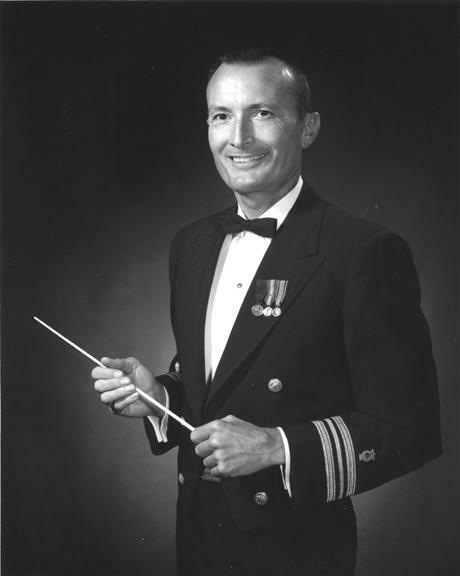 Mr. Phillips subsequently became Leader of the U. S. Navy band in Washington, DC, and has the distinction of being the first officer in the music program to achieve the rank of Captain. Country vocalist and guitarist, Ben Winter. In the post Vietnam era, an attempt was made to reach young people for the new "All Volunteer" military through popular music. 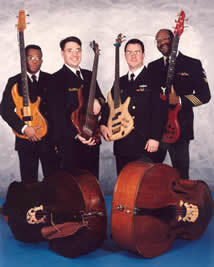 This included the Navy's newly formed rock and country groups. but spent only a short time here before joining "Country Current,"
the very popular country and bluegrass ensemble from the Navy Band, Washington, DC. 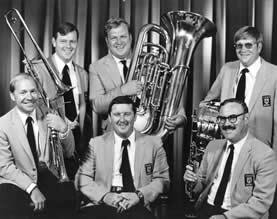 John Richard Bledsoe, a native of Miami, FL began his professional career as a French horn instrumentalist while attending the University of Miami. After enlisting in the Navy in 1958 he was assigned to duties with bands in the US Sixth Fleet and elsewhere. 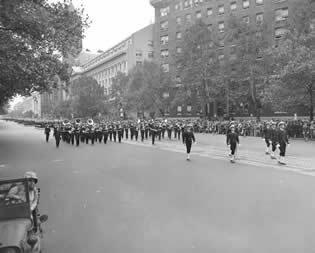 From 1963-67 he performed with the concert band of the US Navy Band in Washington, DC, and served as the band's drum major. Following duty as an enlisted bandmaster in the Atlantic Fleet, he was promoted to officer status and returned to Washington as Director of the Sea Chanters. 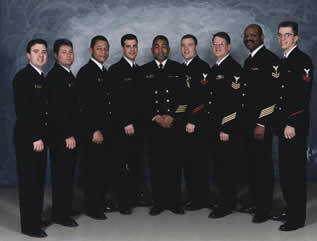 Subsequent tours of duty included assignments in the Bureau of Naval Personnel and with the Office of Navy Information. 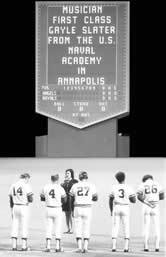 Between September 1975 and January 1979 he was Leader, US Naval Academy Band, Annapolis, MD. Musician 1st Class Gayle Slater performing the National Anthem for the home opener of the 1976 Kansas City Royals. 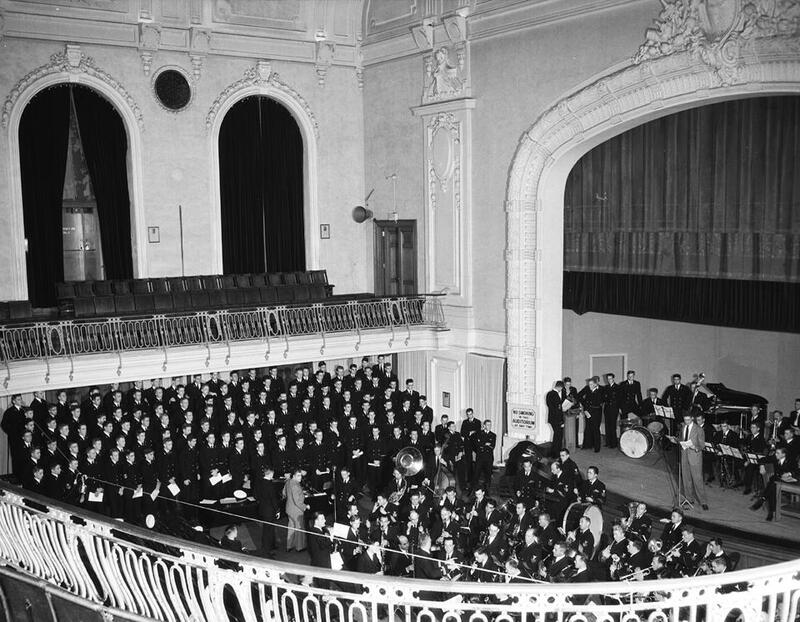 While at the Naval Academy, Bledsoe instituted the practice of presenting concerts on a regular series basis, with winter and summer seasons. To honor the Bicentennial of the United States in 1976, the Naval Academy Band, in conjunction with the City of Annapolis, founded the present series of summer concerts at the city dock known as the "Summer Serenade." The tradition of performing the "1812 Overture" at the final Summer Concert started in 1976 as well, a tradition that continues to this day. 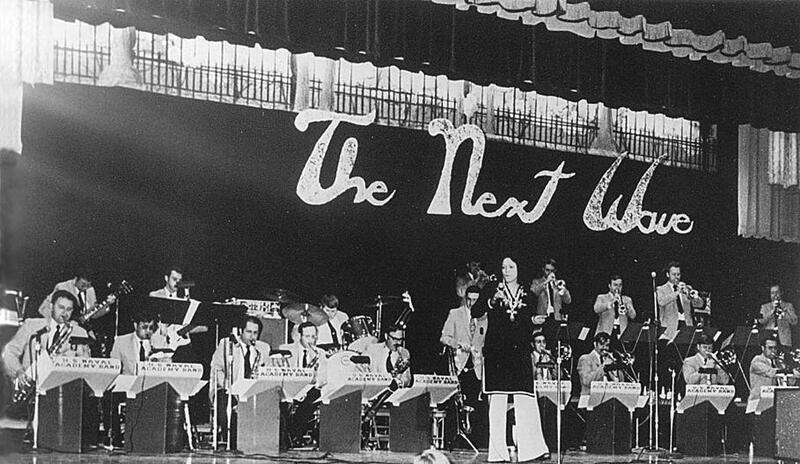 "The Next Wave" in concert in Angola, New York, 1977. Gayle Slater, Michael Pesses (? ), Bill Lyle, Steve Slater, Emmett Wright, Gordon Beckwith. Larry Callahan, Paul Geitzenhauer, Dewayne McClaeb. 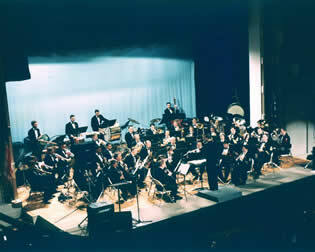 During the same period, what has become the band's annual "Side-by-Side" concert was begun to showcase the talents of local high school musicians. 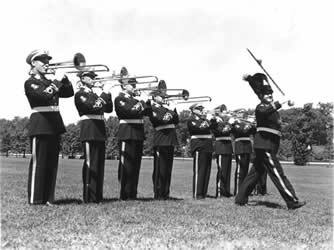 On September 3, 1976 automatic advancement to the rank of E-6 (Musician 1st Class) for personnel assigned to the Naval Academy Band was discontinued. 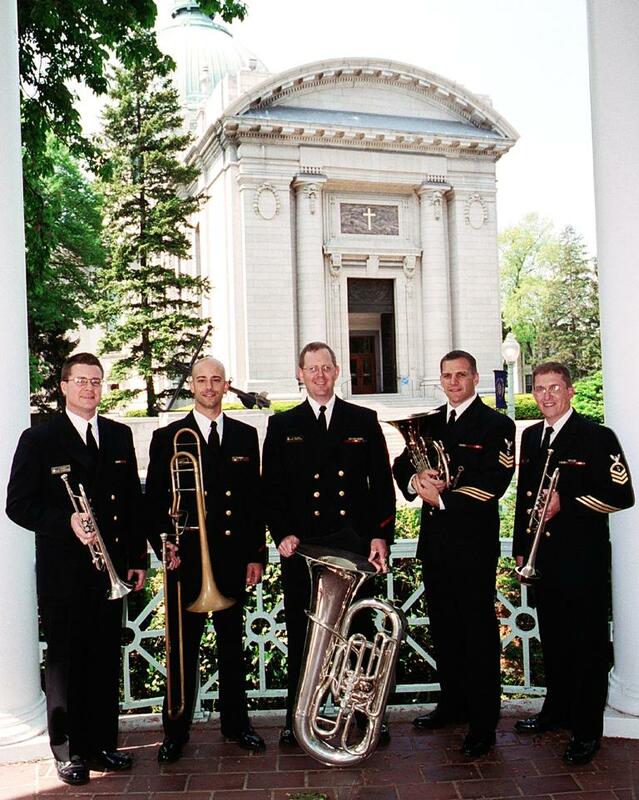 The Naval Academy Band's allowance was structured from Petty Officer 3rd Class through Master Chief and tour lengths established at four years. During Mr. Bledsoe's tenure there were trips to New York City and San Antonio, performances at a Kansas City Royals home game, a Yankees/Dodgers World Series game, and a joint concert with the visiting Japanese Training Squadron Band. 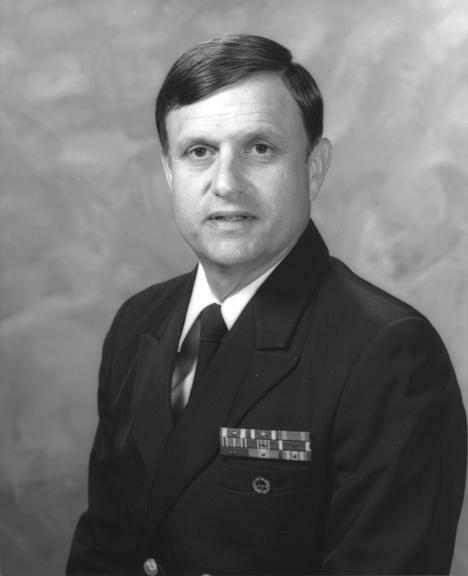 Commander Bledsoe retired from the Navy in 1990. The musical career of Commander Allen E. Beck began in Defiance, OH where he began playing piano at the age of five. Two years later, he extended this study to the saxophone and clarinet. Upon graduation from high school, he was awarded a scholarship to attend the Eastman School of Music, where he majored in music education. A member of the Naval Reserve since 1954, Commander Beck enlisted in the regular Navy in 1957 and was selected for duty as a clarinetist with the United States Navy Band. In July of 1960, he left the band to gain more experience in the Navy's music program, serving in Fleet Bands as player and Leader, serving as instructor at the School of Music, and working at the Music Branch as Detailer and Material Assistant, before his appointment to Warrant Officer in 1966. In 1969 he was commissioned an Ensign and served at the School of Music, US Navy Band and, as head of the Music Branch. In January 1979 he reported as Leader of the Naval Academy Band, a position he held until 1984 when he became Leader of the US Navy Band, Washington, DC. Upon his arrival, Mr. Beck reorganized the Band into musical units consisting of a wind ensemble (from which the Woodwind and Brass quintets and the Dixie group were drawn), a show band, led by Assistant Leader, CWO2 Doyle Church, and the Electric Brigade, a rock group. 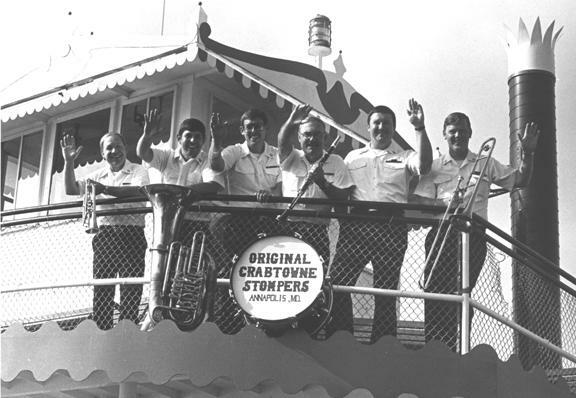 The Show Band and Electric Brigade toured extensively, including Great Lakes tours aboard the USS Law, trips to Guantanamo Bay, Cuba, Puerto Rico, in addition to numerous tours through the surrounding states. 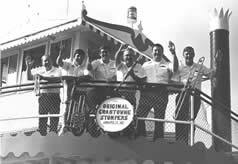 The Original Crabtowne Stompers performed a concert series at the World's Fair in Knoxville, TN, and the most ambitious trip of all, the 1983 Army-Navy football game in Pasadena, CA. 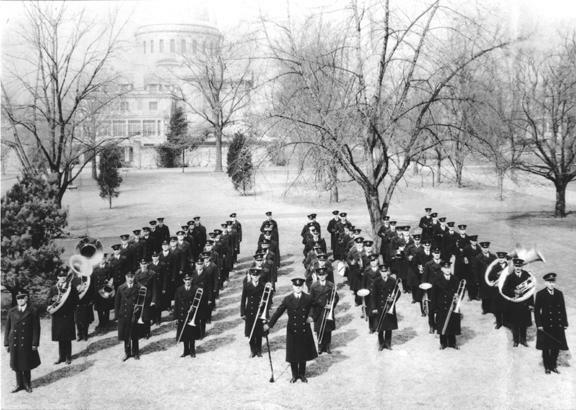 The entire USNA Band, including the marching band, wind ensemble, rock band and jazz ensemble, performed concerts in the area in the days preceding the game. These included a concert at Pasadena City College with USNA Band and the Military Academy Band joining forces, "Next Wave" backing up Mr. Alan Thicke on his nationally televised program "Thicke of the Night", and a parade through Pasadena to the Rose Bowl. Commander Beck continued the annual Side By Side concert and rehearsals featuring outstanding high school musicians as guests, but added a guest conductor and clinician, creating a wonderful learning experience for all involved. "All Hands on Deck for Bob Hope's All-Star Birthday Party at Annapolis." 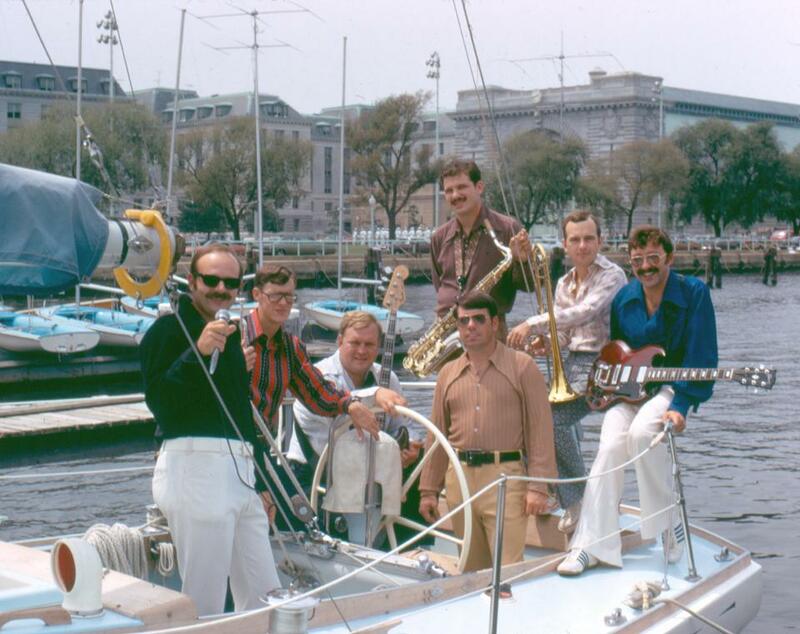 In May of 1982 the band participated in the taping of a prime time Bob Hope television special "All Hands on Deck for Bob Hope's All Star Birthday Party at Annapolis." 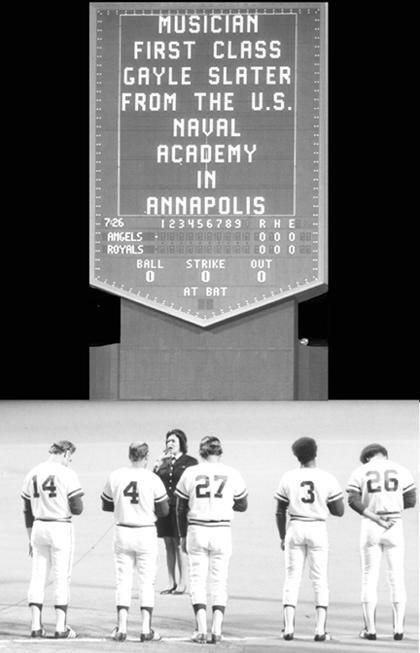 It was taped at Navy Marine Corps Stadium over three rainy days and featured many stars, midshipmen, and the band. The photo above contains (clockwise from upper left): James Coburn, members of the Naval Academy Band, Bernadette Peters, Bob Hope, Brooke Shields, James Coburn & Christy Brinkley, Brooke Shields, Bob Hope, Phyllis Hyman and dancers from the cast of "Sophisticated Ladies," and Bob Hope enjoying his 79th birthday bellygram. Incidentally, the dancer was Lorna Cunningham, the spouse of a Naval Academy Band member. 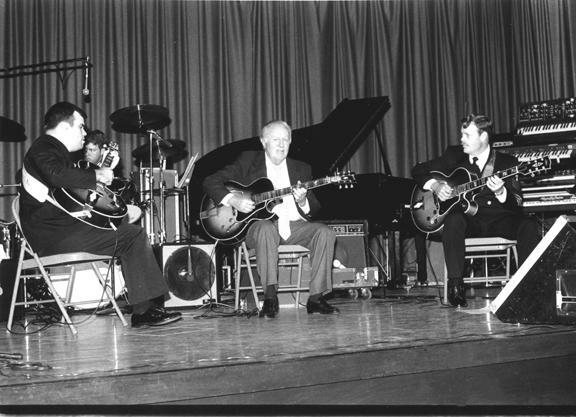 Steve Abshire, Herb Ellis, and John Derby, the Navy's version of the "Great Guitars"
Other notable performances include the "Guitar Showcase" of 1981 featuring Naval Academy and other Washington area Navy guitarists with guest artist Herb Ellis, and the first Naval Academy Band recital featuring the solo and ensemble talents of members and guests from the Navy Band and the Army Field Band. This series continues today as the Recital Series. 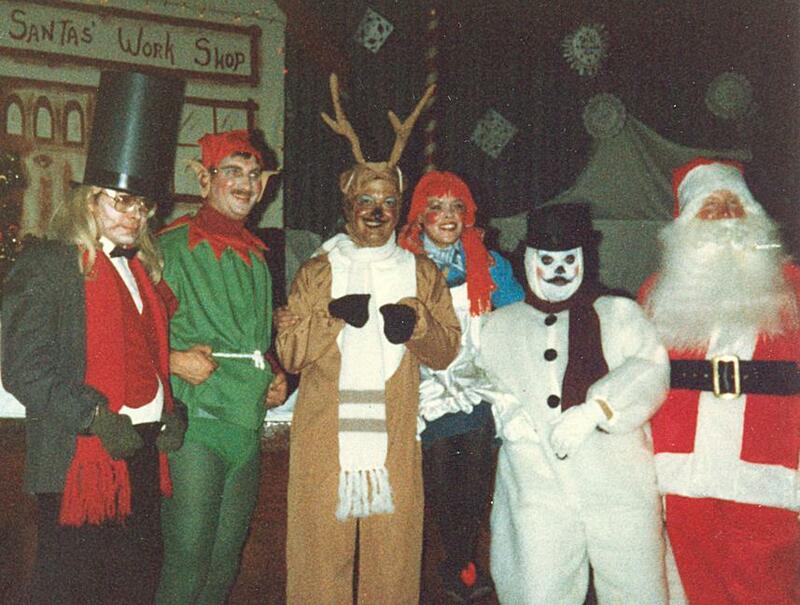 The 1983 cast of the Children's Holiday Matinee, "The Wizard of Christmas"
This play, written by band member Don Carter, was a melding of "A Christmas Carol" and "The Wizard of Oz." The cast included (l-r) John Jenson as the mean old Mr. Scrooge, Lloyd Hopkin as the too tall elf in search of a job, Gary Wolfe as the reindeer in search of a brain, Gayle Thompson as Dorothy, the rag doll dropped from Santa's sleigh in search of her home, Tom Steele as the cowardly snowman, and Wayne Walton as Santa, "The Wizard of Christmas" who made all dreams come true! 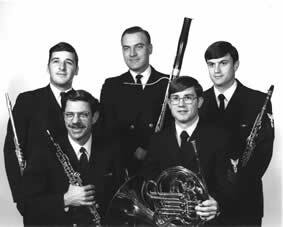 In 1983 the USNA Band regained its Special Band Status with base manning at Petty Officer 2nd Class and a return to permanent duty. 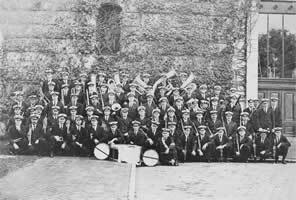 All members below the rank of Musician 2nd Class were promoted and all members of the band auditioned in order to retain their positions. Commander Raymond A. Ascione became the 19th Leader in 1984. Ascione, a native of New Castle, PA, received a bachelor's degree in music from St. Leo College and a Masters of Science Degree in Human Resources Management from Troy State University. During his long and distinguished career, his assignments as a clarinet and saxophone instrumentalist and bandmaster included tours with the Naval Academy Band first as an instrumentalist, and eventually, as Assistant Leader and Leader. 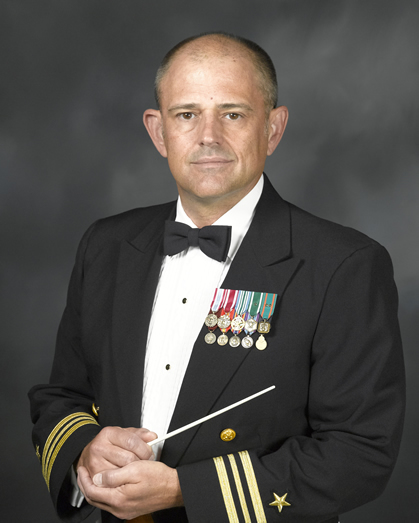 He also served as Operations Officer and Assistant Leader of the Navy Band in Washington DC, Director of the Navy Music Program, and Commanding Officer of the Armed Forces School of Music in Norfolk, VA. 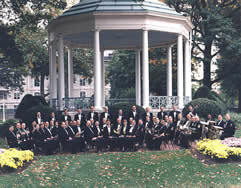 Some milestones include the filming of the concert band performing on the Zimmermann Bandstand for James Michener's "Space," the Original Crabtowne Stompers performances in New Orleans for Mardi Gras, the final Show Band performance at the Bavarian Funfest in Sharon, PA, and the Electric Brigade performance in Bermuda just in time for hurricane Emily. This storm achieved a maximum wind speed of 125 miles per hour, and was the fastest moving hurricane of any known hurricane in the 20th century. There were ensemble changes during this time including the formation of a Tuba/Euphonium Quartet, "Barnacle Bones," a new trombone quartet, a new Naval Academy Band Jazz Ensemble, (the big band "Next Wave" had been inactive for the past few years), the dissolution of the Show band "Chesapeake," and the Electric Brigade format change to a ten-piece contemporary music ensemble. Commander Ascione was relieved as leader in 1988 by Lieutenant Commander John Fluck and retired from 35 years of active naval service in September 1994. 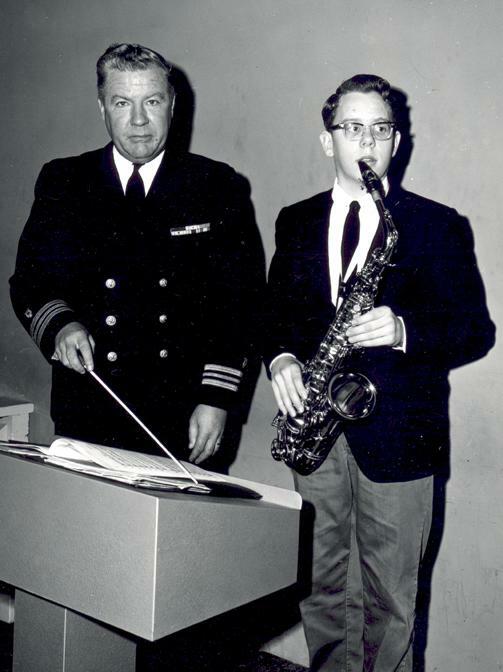 Born in Bethlehem, Pennsylvania, Lieutenant Commander John Fluck began his musical studies at an early age with piano lessons at age seven and arranging and composition at age 15. He enlisted in the Navy in 1958 and attended the Navy School of Music in Washington, DC. His Navy music assignments took him twice to Japan and to the Armed Forces School of Music, where he served as piano and arranging instructor, rehearsal conductor, and staff arranger. In 1970 he was appointed a warrant officer and assigned as director of the Naval Air Station Band in Pensacola, Florida. 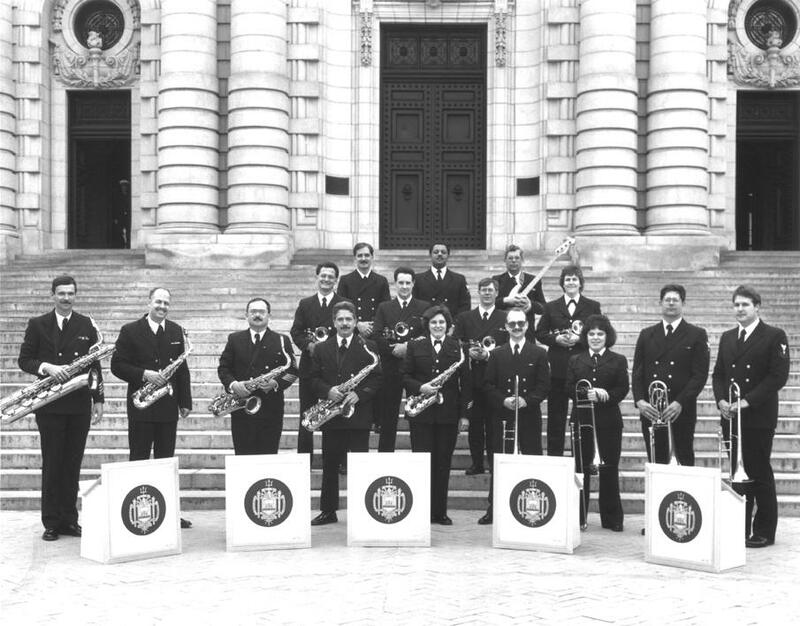 He returned to the School of Music as director of the Navy Show Band in 1972 and accompanied the band on two South American tours in conjunction with the Navy's military exercises (UNITAS) with South American allies. Commissioned a lieutenant (junior grade) in 1974, he was named director of the Navy Band Fleet Support Unit, served as director of the Atlantic Fleet Band, as assistant leader of the United States Navy Band, and as assistant program manager of the Navy Music Program. Jeff Scaringe, Rhodes Whitehill, Max Murray. The Story: When traveling in these jumpsuits, people often ask who we are. 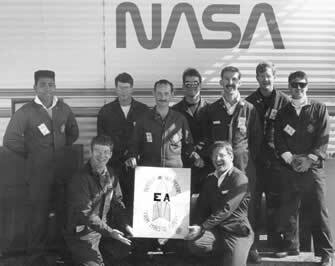 As a joke someone replied that we were part of the new "Enlisted Astronaut" program. People seemed intrigued by this fictitious program, often asking more questions leading to elaborate tales. One day while playing an airshow in Pennsylvania we spotted this NASA exhibit and thought it would be a great photo opportunity. 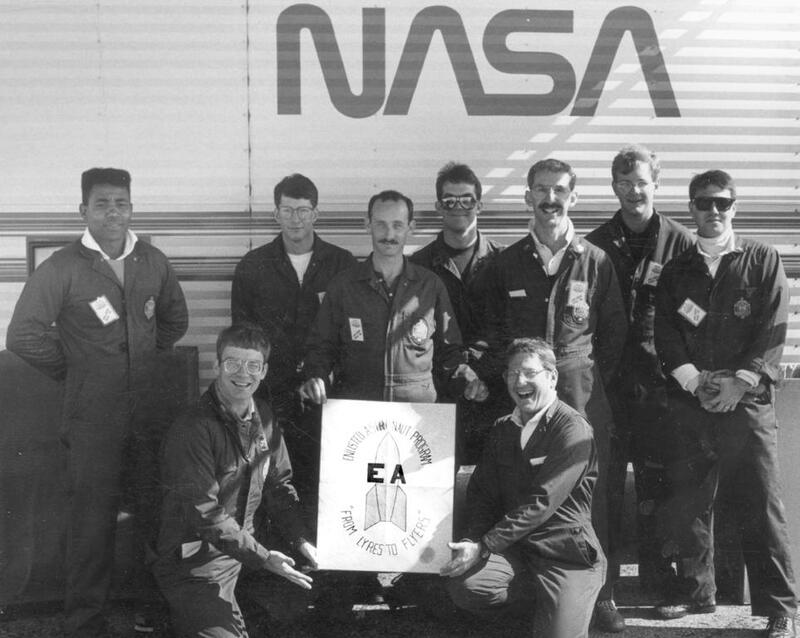 The sign reads " Enlisted Astronaut Program From Lyres to Flyers." By the way, a very large crowd gathered to photograph this distinguished group. The truth was revealed when the band performed to a very appreciative crowd. 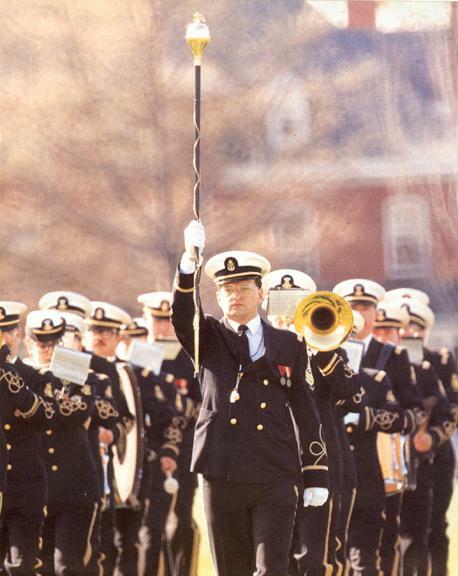 Lieutenant Commander Fluck was assigned as Assistant Director of the Naval Academy band in July 1987 and became director of the band in August 1988. During his brief tenure as the band's director, he presented several imaginative programs, including a big band spectacular, an evening of African-American music, a concert of Asian music, and a joint concert with the Air Force Tactical Command Band. 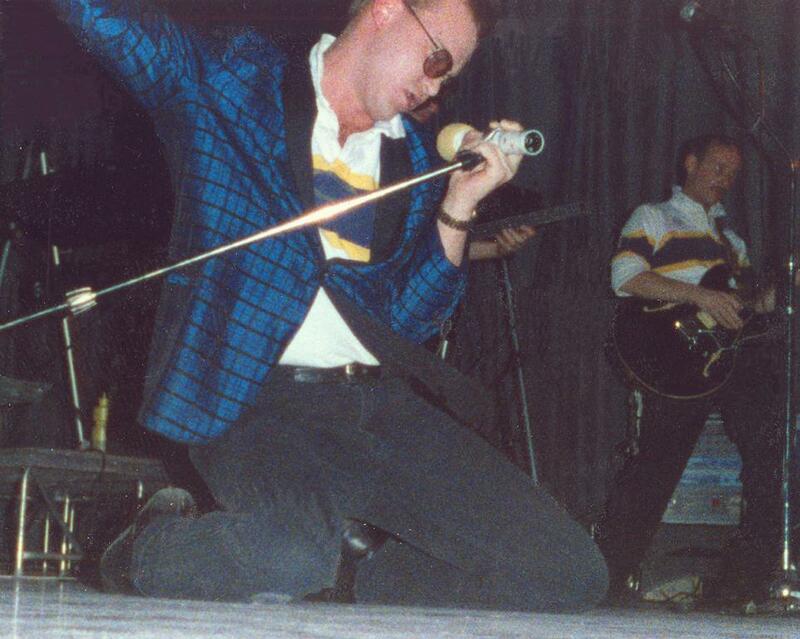 Rhodes Whitehill on his knees in a memorable performance of Elvis Presley's "Heartbreak Hotel." 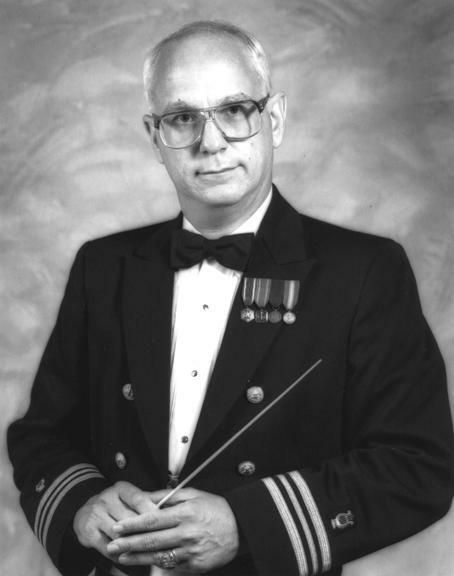 An accomplished arranger, Lieutenant Commander Fluck's works are well known and have been performed by many of the premier service bands and numerous civilian music groups. Fluck retired in July 1989. A native of La Junta, CO, Commander Michael Burch-Pesses enlisted in the Navy in 1962 and served in Navy bands in Newport, RI; Great Lakes, IL; and the US SIXTH Fleet in Gaeta, Italy prior to being selected as a Warrant Officer. Other assignments include Director of Navy Show Band West in San Diego and Assistant Leader of the Naval Academy Band and US Navy Band, Navy Band Liaison Officer at the Pentagon, Director of Navy Bands San Diego, Orlando, the US SEVENTH Fleet Band in Yokosuka, Japan, Leader of the Naval Academy Band, and Head of the Navy Music Program. 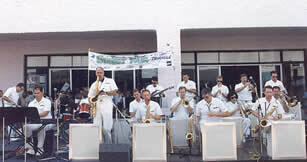 During this time the concert band played the dedication of the Naval Academy's new Bob Hope Performing Arts Center, the Percussion Ensemble was formed, the Original Crabtowne Stompers traveled to and performed for Fleet Week in San Francisco, CA, the marching band, Next Wave and Electric Brigade flew to Key West FL, for Fantasy Fest, Electric Brigade entertained large crowds awaiting the arrival of President George H. Bush at NAS Bermuda, and the ceremonial band played final official departure honors for President George H. Bush from Andrews AFB. Incidentally, Electric Brigade performed in Bermuda so often during this time (at least twice per year, for the Navy and Seabee Balls) that the Bermuda Seabees made them "Honorary Seabees and presented them with Bermuda Seabee jackets. 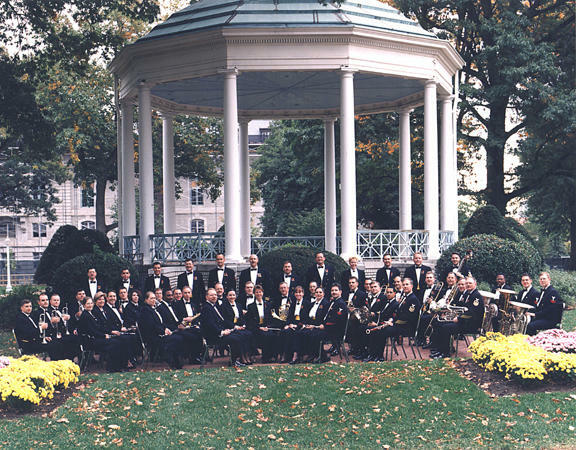 In 1993 the USNA Band was awarded the Col. George S. Howard Citation of Music Excellence from the John Philip Sousa Foundation, the highest civilian award for a military band. 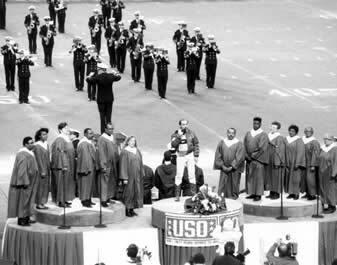 "God Bless the U.S.A." during half-time at the 1990 Army-Navy game. 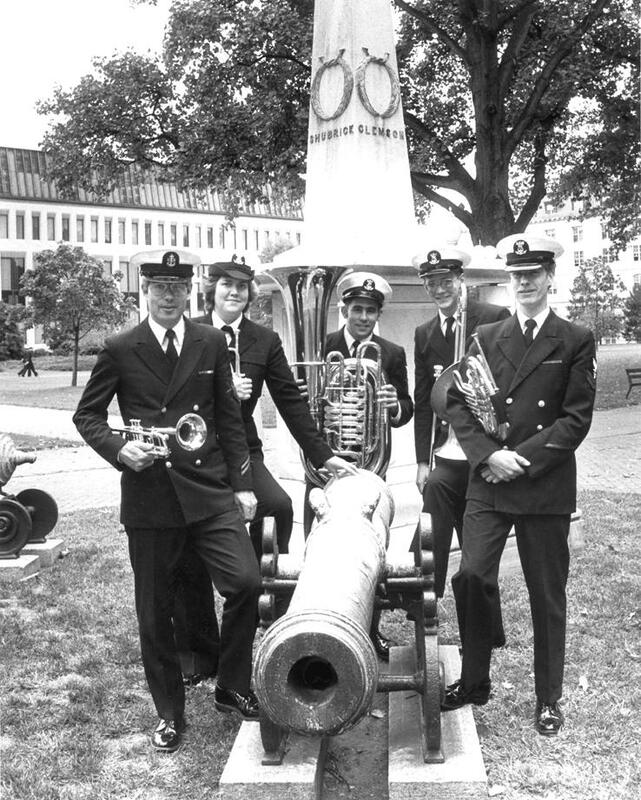 At the time of the presentation, the Naval Academy Band was only the second Navy band to receive the award. Commander Burch-Pesses also led the fight against a congressional push to eliminate all three service academy bands as a cost saving measure. As in 1975, the band received overwhelming support from the community, local politicians, and retirees. With their help, the bill was defeated. Musician 1st Class Lorelei Conrad rehearsing the Concert Band. She went on to become the first woman officer and Band Leader in the Navy Music Program. 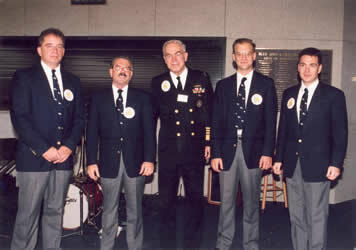 The Superintendent's Combo with the Chief of Naval Operations, 1991. 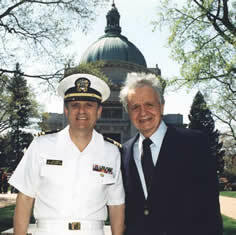 Commander Burch-Pesses was relieved by Commander Thomas Metcalf in 1993, and upon his retirement in 1995, was awarded the Legion of Merit, the highest award ever received by a Navy Bandmaster. Bill Clinton's Inauguration Day, 1993. Commander Michael Burch-Pesses, conducting. 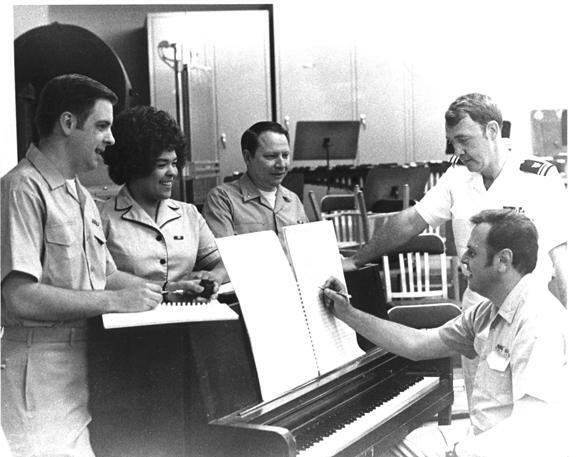 Commander Thomas E. Metcalf, a native of Paducah, KY, enlisted in the Navy in 1967, and graduated first in his class from the basic course of instruction at the Navy School of Music. After tours as a French horn instrumentalist in Navy bands in Great Lakes, IL and Pearl Harbor, HI, he returned to the School of Music nd completed the 52-week Advanced Course, graduating early while standing first in his class. During his next assignment as Material Assistant to the Head of the Navy Music Program in the Bureau of Naval Personnel, he was advanced to Warrant officer in 1975. Blake Cramer, Max Murray, Tracy Ford. Jeff Diehl, Mike Thompson, Frank Russo. 3rd Row: Gary Wolfe, Randy Martell, Dan Orban, Ken Pfabe. His first assignment as an officer in the Navy Music Program was Training/Fleet Support Officer, School of Music. 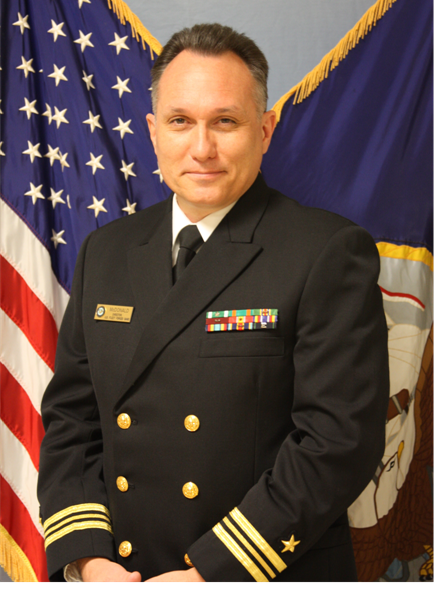 While serving as the Director of the Navy Band in Great Lakes, he was selected as a Limited Duty Officer, and advanced from Chief Warrant Officer to Lieutenant Junior Grade. The USNA Band Saxophone Quartet, 1994. Chris Raifsnyder, tenor; Jay Marcum, baritone; Craig Young, alto; James Rodak, soprano. Subsequent tours included assignments as Executive Officer, School of Music; Assistant Leader, U.S. 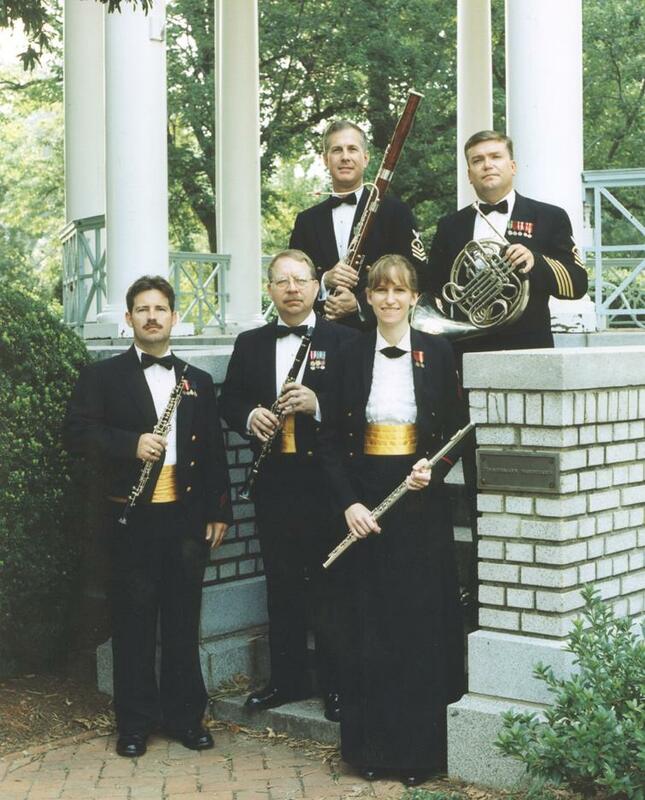 Naval Academy Band (he administered the playing portion of the audition process in 1983); Director, CINCPACFLT Band, Pearl Harbor; Head of the Navy's Music Program, Bureau of Naval Personnel; Music Liaison Officer for the Chief of Information in the Pentagon, and Director, U.S. 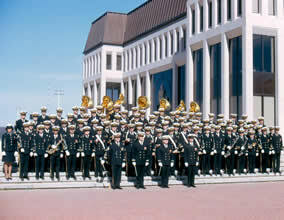 Naval Academy Band. The Superintendent's Combo with the Superintendent and Vice Chief of Naval Operations, 1994. 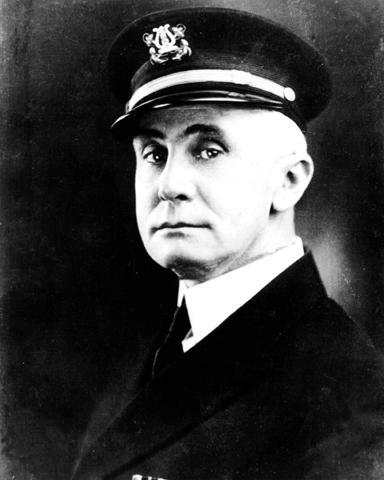 Admiral Stanley R. Arthur, Blake Cramer. 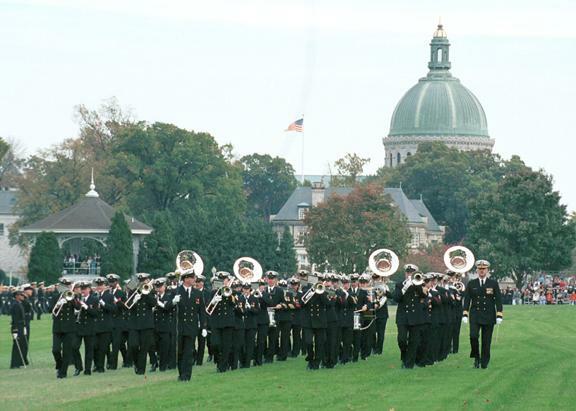 The Naval Academy Band was present at a couple of important Maryland events during this time. 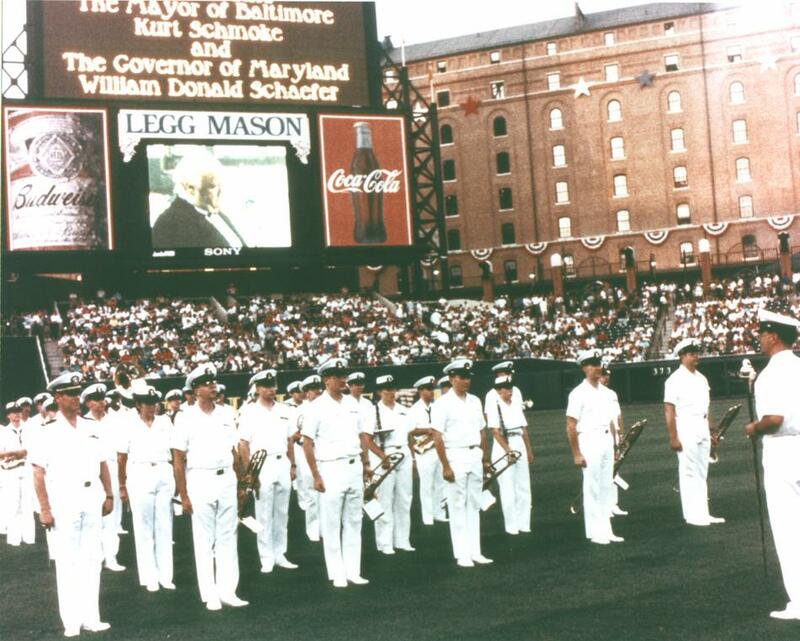 The performance at the opening ceremonies of the 1993 All Star baseball game at Baltimore's Camden Yards stadium was seen by millions of American baseball fans. T.U.B.A. Journal. This photo was also prominently displayed in the Superintendent's quarters. On October 8, 1995 the USNA Band performed on the tarmac at Baltimore-Washington Airport in preparation for the Pope John Paul II's departure to Rome, Italy. 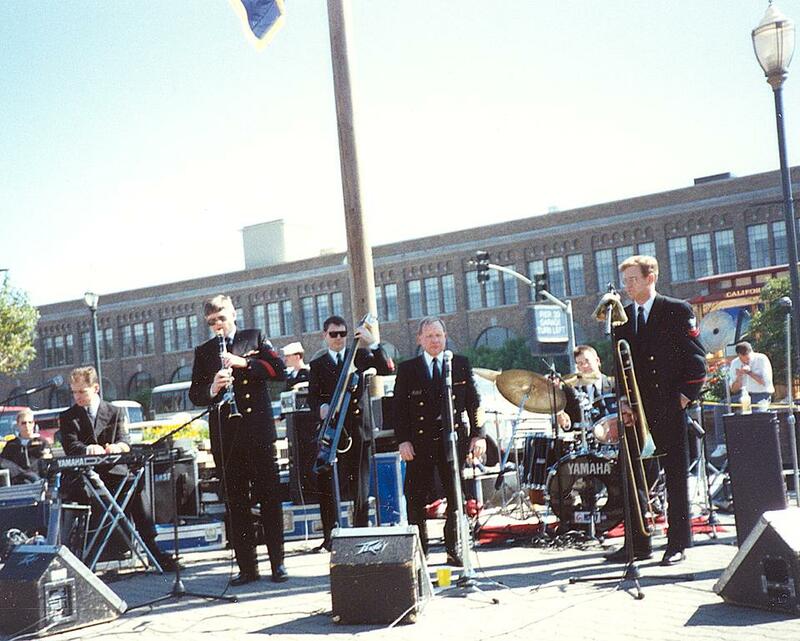 In sharp contrast to the numerous trips south and to the Caribbean, the Electric Brigade flew to Keflavik, Iceland in October 1993 to play for the Navy Ball. 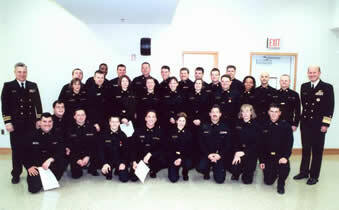 In 1996 Commander Metcalf transferred to the School of Music as Commanding Officer, then retired from active duty. The USNA Band Brass Quintet, 1996. Dan Orban, trumpet; Jim Bean, trumpet. "Returning to the Academy as leader of the Navy's oldest band is a dream come true. It has always been my goal to come home as the band leader, but for a while it just didn't seem like it would happen. Being able to work with these outstanding musicians is truly a rewarding experience. I just couldn't ask for a better group of professionals. We are very fortunate because we have terrific support from our command. From the Superintendent, Adm. Charles Larson, and the Commandant, Capt. Randy Bogle, on down the chain of command, we are treated as important members of the Naval Academy family." - Commander Ralph Gambone (from Master Chief Musician James Cunningham's article 'A Childhood Dream Realized' that appeared in "Inside Annapolis Magazine" in 1997). Commander Gambone enlisted in the Navy in 1969 after receiving his bachelor's degree in music from Towson State University in Baltimore. 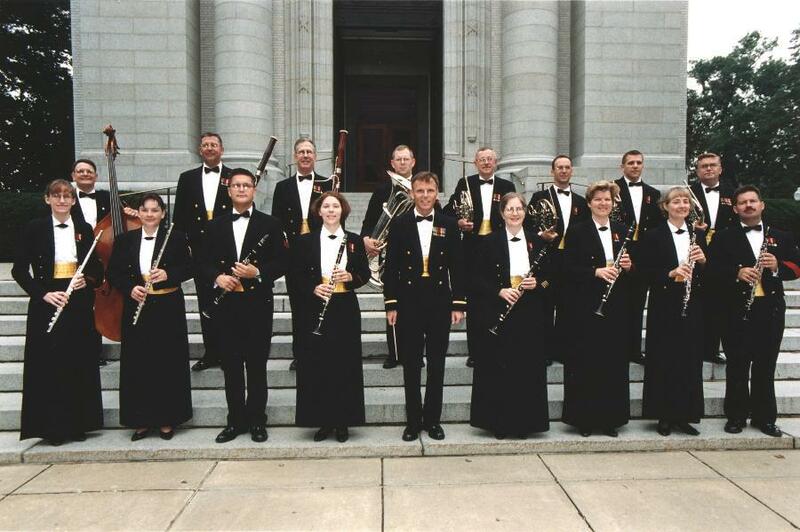 He was first assigned to the Naval Academy Band as a clarinet instrumentalist, and also served as conductor of the Midshipman Stage and Concert Bands. While here he earned a master's degree in music from Catholic University in Washington, D.C. In 1974 he transferred to the fleet, serving aboard the cruiser USS Little Rock (CLG 4), then was assigned to The Navy Band in Washington, DC. 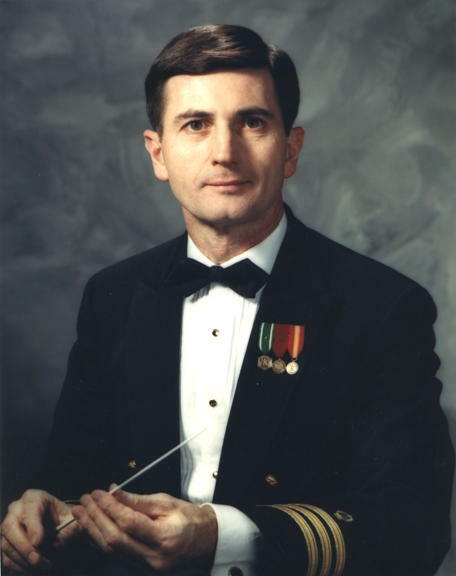 After three years with the band and a promotion to Chief Musician, he was assigned to the Bureau of Naval Personnel as Assistant Budget Manager for the Navy Music Program in 1978. 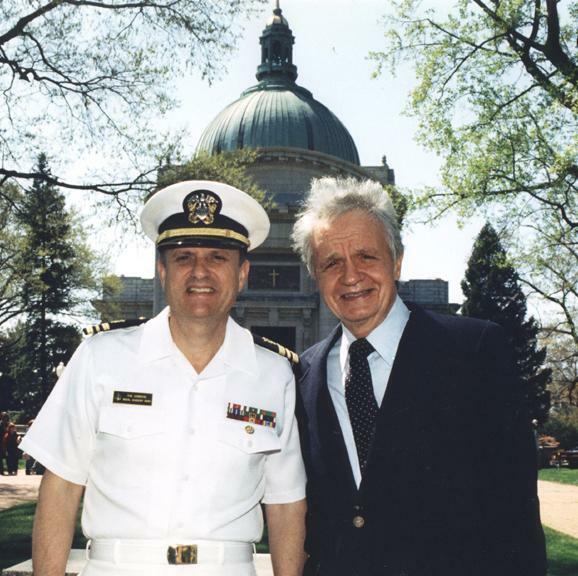 In 1981, he was commissioned an ensign and reported for duty as Music Program Liaison Officer for the Navy Chief of Information in the Pentagon. 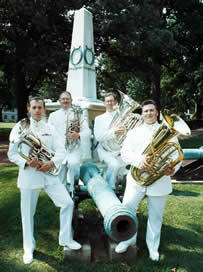 The USNA Band Tuba Euphonium Quartet, 1996. Karl Schultz, Ken Shrum, Jarrod Williams, Kelly O'Bryant. The next few years led him to assignments throughout the fleet including, Director, Navy Bands San Diego and Seventh Fleet Band, Supply Officer and Assistant Leader for The United States Navy Band, and Executive Officer and Commanding Officer of the School of Music in Little Creek, VA. 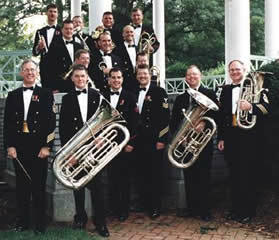 Under the direction of Commander Gambone the band received a Meritorious Unit Commendation from the Secretary of the Navy, an honor given to Navy or Marine Corps units with outstanding achievements, and a formal agreement between the USNA Band and Anne Arundel County Public Schools (Maryland) was signed in 1997. This Partnership Agreement promises support from the Naval Academy Band to the music programs of the county public schools, a tradition dating back to the USNA Band Wives Club Band Concerto Competition. 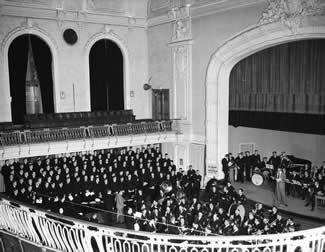 The band performed a concert in the beautifully renovated Mahan Hall, a favorite venue for band concerts since the days of Charles Zimmermann. Speaking of renovations, the band moved from its home of more than 30 years to a temporary space in order to update and improve the band room. This was a major task completed in a week's time because of detailed planning. A new ensemble was formed, a clarinet quartet dubbed "The Cane Mutiny," and a unique recital called the "Bassfest" closed with a piece entitled "The Day the Bass Players Took Over the World." It featured 14 bass players at the same time! Comander Gambone was relieved by Commander J. Michael Alverson and became leader of the U.S. Navy Band in August of 1998. The day the bass players took over the world! Ben Grant, Max Murray, Lee MacDowell, and Ken Meeks presented a recital called the "Bassfest" and closed with a piece featuring 14 bass players. 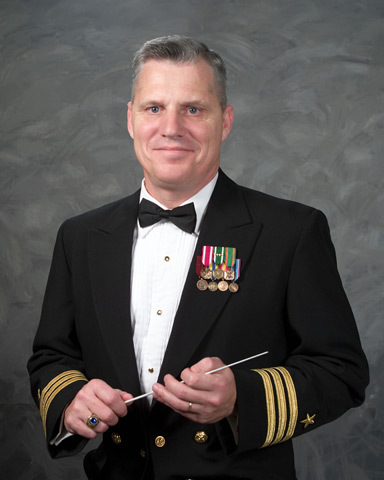 A native of Etowah, Tennessee, Commander J. Michael "Mike" Alverson is a graduate of the University of Tennessee-Knoxville holding a bachelors degree in Music Education. He enlisted in the Navy in April 1971, and after graduating Personnelman "A" School, deployed aboard the USS CHUKAWAN (AO-100). He received a lateral conversion to the Musician rating and was assigned as a vocalist with The U.S. Navy Band, in Washington, DC. 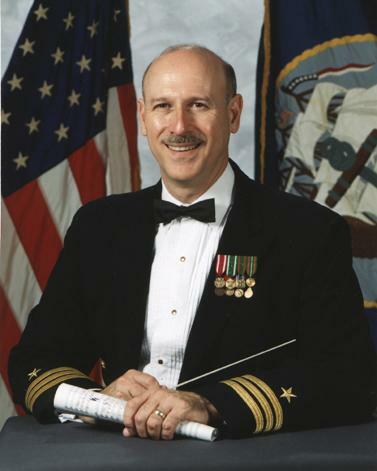 Commander Alverson's following tours of duty included Navy Band Orlando, FL, as Operations Assistant and vocal soloist, and the Armed Forces School of Music, Norfolk, Virginia, serving as the Navy's vocal instructor, Director of the School of Music Chorus, and Editor of the Navy Music Program's newspaper, "Ledger Lines." After completing the Intermediate and Enlisted Bandleaders courses, Commander Alverson reported to the Bureau of Naval Personnel as Detailer and Manpower Resource Analyst. 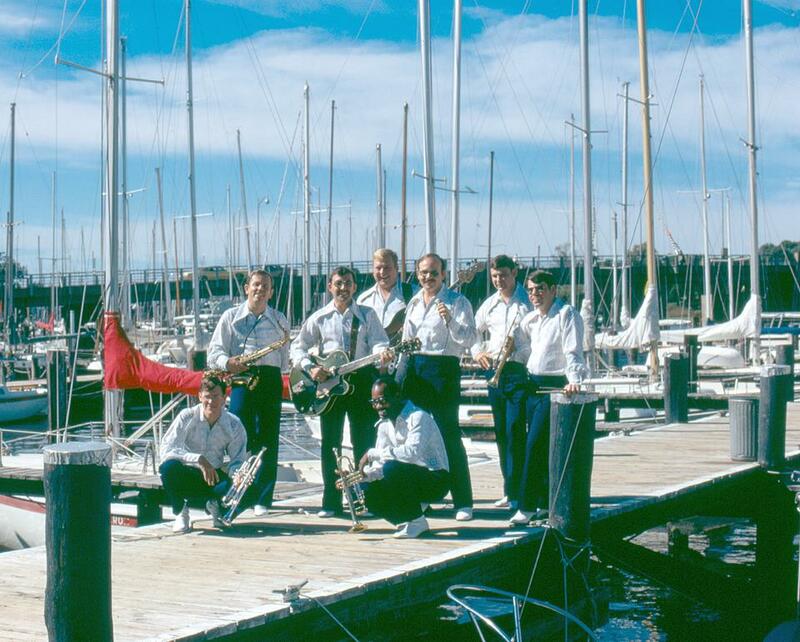 In 1983 while serving with Navy Band Newport, Rhode Island, he received his appointment to ensign and was reassigned to the United States Naval Academy Band as Supply Officer. 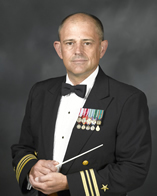 Commander Alverson served as Director, Navy Band Charleston, SC, U.S. Pacific Fleet Band, Pearl Harbor, HI, and U.S. Atlantic Fleet Band, Norfolk, VA, as well as both Director of Training and Executive Officer of the Armed Forces School of Music. 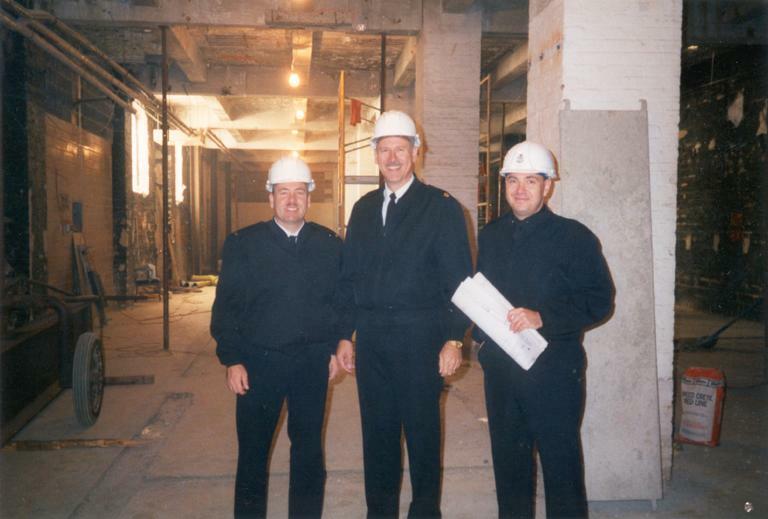 Inside the Naval Academy Band room during renovations, 1999. (l-r): Ensign Grant, Commander Alverson, and Senior Chief Murray, the renovation coordinator. 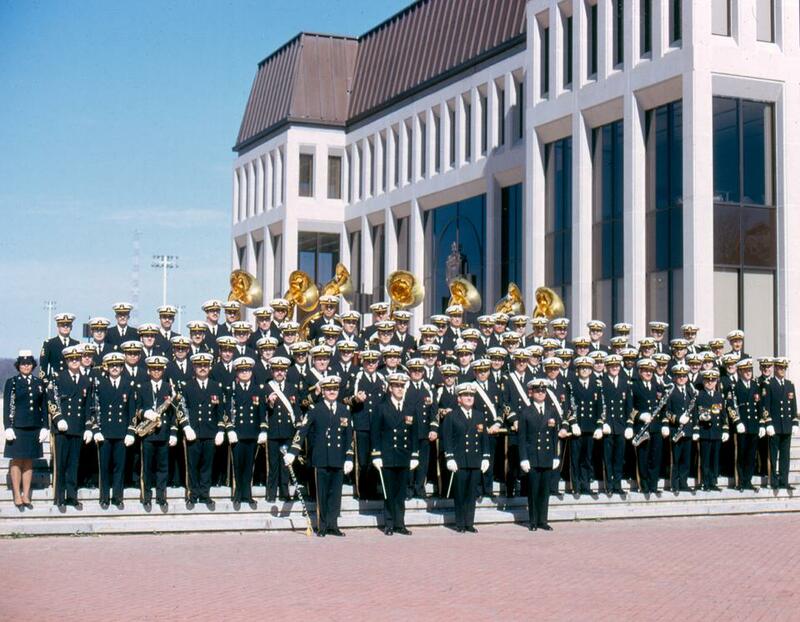 During this time the Naval Academy, including the band, received a Meritorious Unit Commendation, and the Band returned to its beautifully renovated spaces. There was some fine-tuning to do, but the large stanchions were gone from the rehearsal room (now EVERYONE can see the conductor), there was a new library with modern storage facilities, a control room for a recording studio, updated office spaces, and many other improvements. 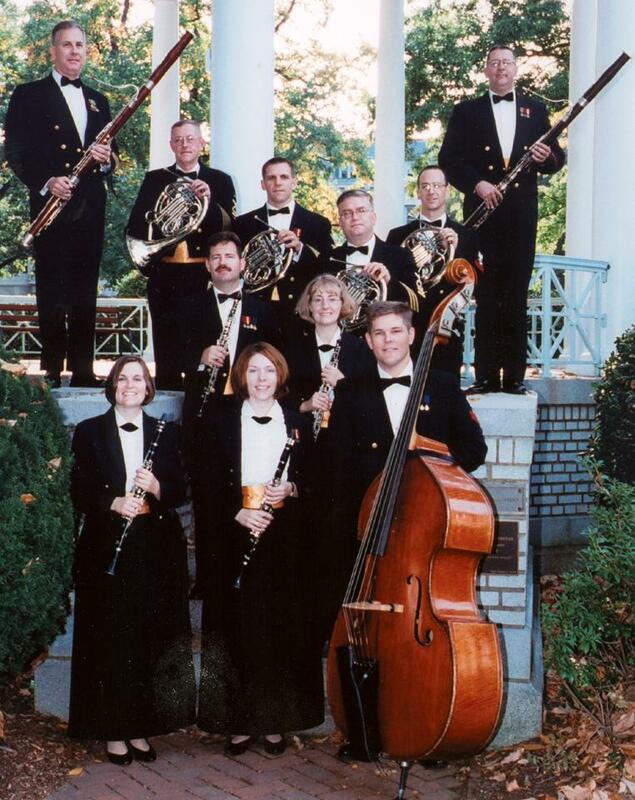 The Chamber Music Series became exceptionally active with individual performers and many large ensembles, including the Chamber Winds, Brass Ensemble,and Wind Octet all presented programs on the Naval Academy grounds as well as in area churches and concert halls. 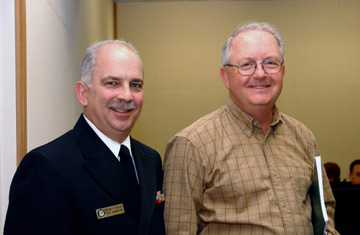 Commander Alverson retired from active duty in 2001. Commander Donald H. Keller, Jr., a native of Stockton, CA, enlisted in the Navy in 1975. He was an accelerated graduate of the Machinist Mate "A" school in Great Lakes, IL and a Learning Resource Instructor while awaiting orders to Nuclear Power school. Commander Keller attended the Navy Nuclear Power School in Vallejo, CA, and was assigned to the USS San Jose (AFS 7) where he served as a hydraulic and air conditioning specialist. 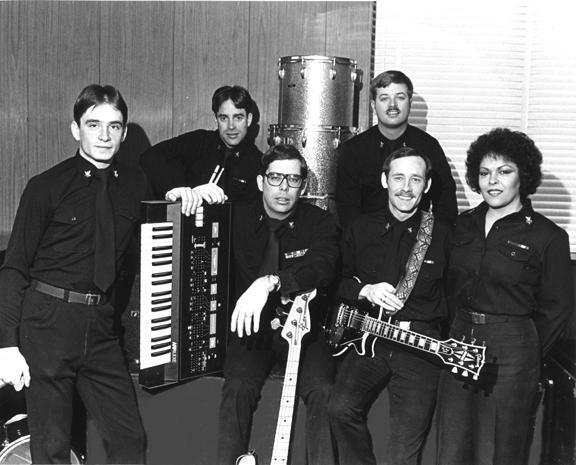 Commander Keller attended the Basic Music course and the Intermediate course at the School of Music in 1981. 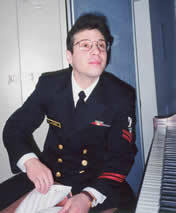 Keller served as a musician at Navy Band Great Lakes, and while assigned to Navy Band Orlando, was selected as a Limited Duty Officer and promoted to Ensign. As an officer, he served as Director, Navy Band San Francisco; Fleet Bandmaster SEVENTH Fleet Band, Yokosuka, Japan; Fleet Bandmaster, SIXTH Fleet Band, Naples, Italy; Training Officer at the Armed Forces School of Music in Norfolk, VA; and as Fleet Bandmaster, ATLANTIC Fleet Band, Norfolk, VA.
1st row: K. Pfabe, J. Hurd, B. Redwine, T. Sargent, R. Ascione, B. Williams, M. Boensel, H. Schultz, J. Tubiolo; 2nd row: Lieutenant Commander D. Keller, C. Stiles, I. Ostrowski, A. Jarjoura, M. Foley, E. Heere, L. Dembowski, T. Pitta, D. Williams, J. Ohlemeyer, Vice Admiral J. R. Ryan, Superintendent, USNA; 3rd row: K. Cherednik, P. Skinner, J. Reycraft, S. DaCol, T. Nix, M. Acosta, T. Siehndel, B. Strawley, J. Fowler, J. Borrelli-Boudreau. 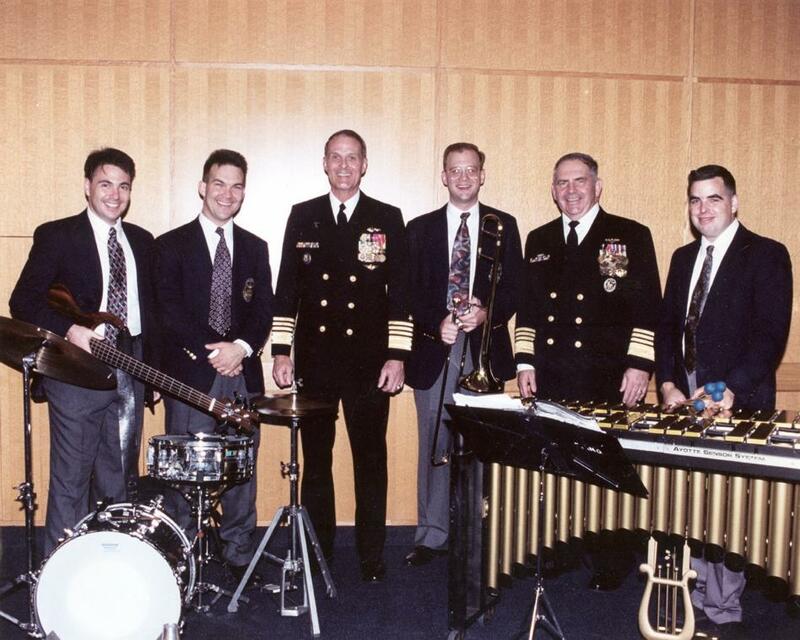 In August of 2001 Commander Keller became the 25th Leader of "The Navy's Oldest and Finest Band." 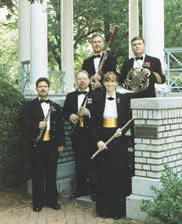 During his tenure, Keller spear-headed the band's sesquicentennial celebration, procuring the needed equipment for the digital recording studio, and bringing the band's budget to the level required for 2002. 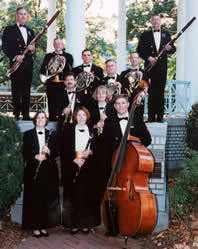 In addition, on March 18, 2002, the USNA Band regained the entry level rank of Musician 1st Class, re-establishing parity with the U.S. Navy Band and all premier bands in the other branches of the military. 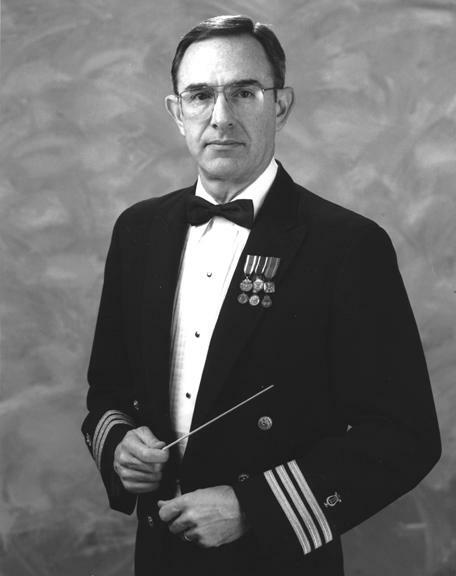 Lieutenant Commander Melvin Paul Kessler, a native of Imperial, Pennsylvania, received a bachelor of music degree in trumpet performance from Carnegie Mellon University, a music education certificate and master of music degree in trumpet performance from Duquesne University, and a master of music degree in conducting from Florida State University. 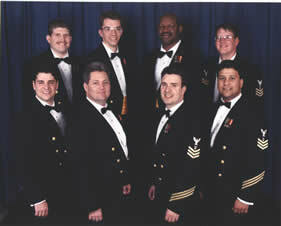 In March of 2005 he became the 26th Leader of The Navy's Oldest and Finest Band. 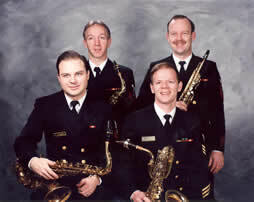 Previously, Lieutenant Commander Kessler had served as Fleet Bandmaster ATLANTIC Fleet Band; Assistant Leader U.S. Navy Band, Washington, DC; Deputy Director Navy Music Program; Director Navy Band Mid-South; Assistant Director ATLANTIC Fleet Band; and trumpet instrumentalist and soloist with the U.S. Navy Band, Washington, DC. 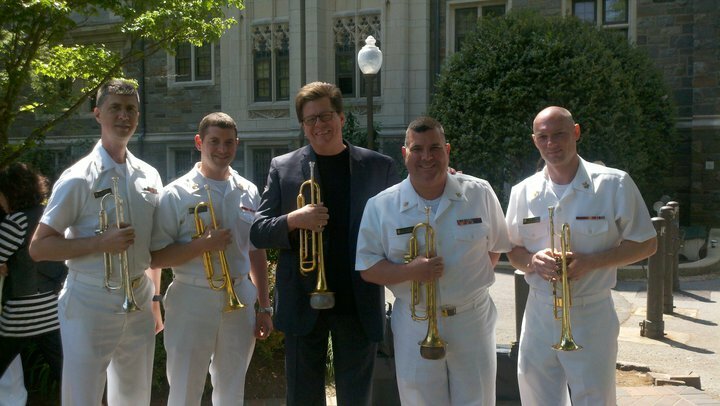 Highlights from Kessler’s time with the Naval Academy Band include a performance at the White House for the Rose Garden Tour in 2006, and collaboration with composer James Barnes on a new composition for the band. Jonathan Reycraft, Todd Nix, Ken Shrum, Raymond Ascione, Jim Hurd, Pat Sarracco, Jarrod Williams, Rick Chappell, Matt Manturuk, Zac Hollister, Matt Shea, Brian Strawley, Sam Chin, David Hanner. Top Row From Left To Right: James Rodak , Ken Pfabe, Jim Bean, Tony Asero, Ronda Ory-Lettie, Joe Tubiolo, Cathy Stiles, Twig Sargent, Ben Redwine, Dawn Henry, Erin Heere, Lynda Dembowski, Heidi Schultz, John Babcock, Jessica Privler, Adam Tillett, Joel Borrelli-Boudreau, Marcia Diehl, Nick Pastelak, Davy DeArmond, Geoff Bayne. 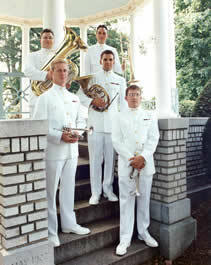 Lieutenant Commander Brian O. Walden was named 27th Director of the Naval Academy Band in 2006. A native of Trenton, SC, Walden enlisted in the Navy in 1981 and served as a trumpet instrumentalist in Charleston, New Orleans, Guam, the Marianas Islands, and Norfolk. 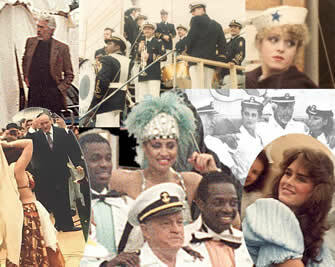 Highlights of these tours were his selection as the Commander, Naval Forces Marianas Sailor of the Year (1988) as well as assistant leader of the U.S. Navy Showband for UNITAS (1991) throughout South America and Africa and tours on board USS Mount Whitney (LCC 20), USS O'Bannon (DD 987) and USS Barnstable County (LST 1197). 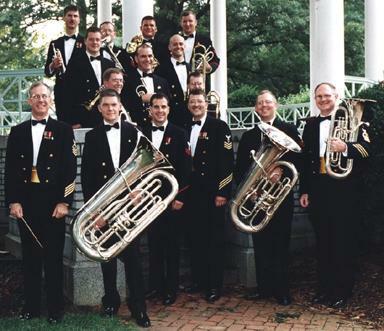 Gunther Schuller with the USNA Band horn section (Rick Chappell, Adam Tillett, Tony Valerio, and Jessica Privler) and guest horns from the U.S. Marine Band "President's Own," the U.S Navy Band, and the U.S. Army Field Band. These 16 horns were used to perform Schuller's piece 'Lines and Contrasts' on April 13, 2007 to a packed house at Maryland Hall for the Creative Arts in Annapolis. During Walden's time with the USNA Band, composer/conductor Gunther Schuller made a guest appearance in 2007, and the Next Wave Jazz Ensemble produced their first album titled "Just Gettin' Started." Upon leaving the Naval Academy Band in 2010, Walden was named Director of the Navy Band in Washington, DC. Lieutenant Commander Stephen J. Trzcinski became the 28th leader of the Navy’s Oldest and Finest in August of 2010 and served in that capacity until October of 2012. Trzcinski was born in Melbourn, England while his father was serving in the U.S. Air Force. He enlisted in the U.S. Navy in 1986, and after completion of Musician ‘A’ School at the School of Music in Norfolk, Virginia, was assigned as a bass trombonist to Navy Band Memphis. Other duty stations include Navy Band Guam and Navy Band Charleston, where he was selected for a commission as a Navy Bandmaster. Following his commissioning in May of 1996, he reported for duty as the Assistant Director of the U.S. Atlantic Fleet Band in Norfolk, and has additionally served as Director of Navy Band Northwest in Seattle, Navy Band Southwest in San Diego, Band Support Officer at the Navy Office of Community Outreach in Millington, Tennessee, and Director of the joint, multi-national Allied Forces Band in Naples, Italy. 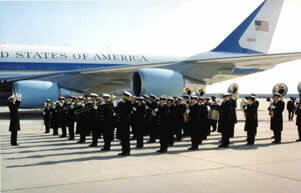 Following the January 2007 merge of the SIXTH Fleet Band and Allied Forces Band into the U.S. 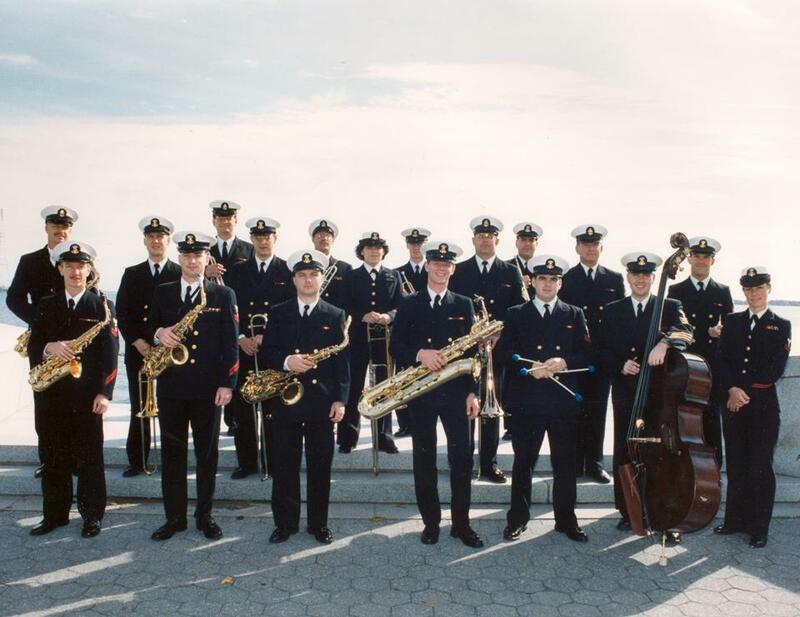 Naval Forces Europe Band, units under Trzcinski's direction deployed extensively throughout Western and Eastern Europe and Africa in support of international public relations and joint, multi-national theatre security cooperation objectives. at Georgetown University Jazz Festival. Continuing to work with the USNA Admission’s Department has reinforced the Electric Brigade’s role as a vital part of Naval Academy recruiting. Additionally, the band has become more integrated with Midshipmen musicians and the Naval Academy Music Department, providing support to the Drum and Bugle Corps during basketball games, performing alongside the Academy’s orchestra for Midshipman musical productions, and continuing to mentor the Midshipman jazz band, Trident Brass. In addition, Lieutenant Commander Trzcinski conducted a concert in which Midshipmen Samuel Strelkoff, performed as a soloist with the band. While in Annapolis, Trzcinski instituted a new education outreach initiative, expanding the Naval Academy Band’s mission of providing music education to school students. He re-instituted the clarinet quartet, trombone quartet, and Crabtowne Stompers, creating additional means of reaching young audiences. Wednesday, July 18, 2012 by Joshua McKerrow. 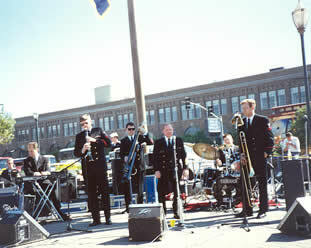 During Trzcinski's tenure, the Naval Academy Band undertook several audio and video recording projects, began use of social media sites Facebook, Twitter, YouTube, and Flickr in order to better spread the message of Navy Music to followers around the world, and performed for numerous high-visibility events, including and the Crabtowne Stompers performance in Dublin, Ireland supporting the Brigade of Midshipmen at the Emerald Isle Classic. Lieutenant Commander Bruce A. McDonald became the 29th leader of the Navy’s Oldest and Finest in October of 2012. 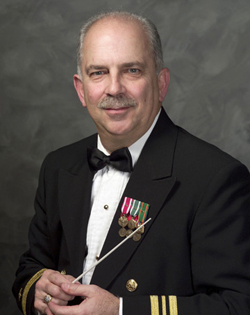 Previously, he had served as Director, U.S. Fleet Forces Band in Norfolk, VA, Fleet Bandmaster of both the Pacific Fleet Band in Pearl Harbor, HI and SIXTH Fleet Band in Naples, Italy, Associate Conductor of the United States Navy Band in Washington, DC, and as Music Program Liaison Officer to the Chief of Information, also in Washington, DC. McDonald is from Rapid City, South Dakota and holds a master's degree in instrumental conducting from the University of Illinois at Urbana-Champaign. 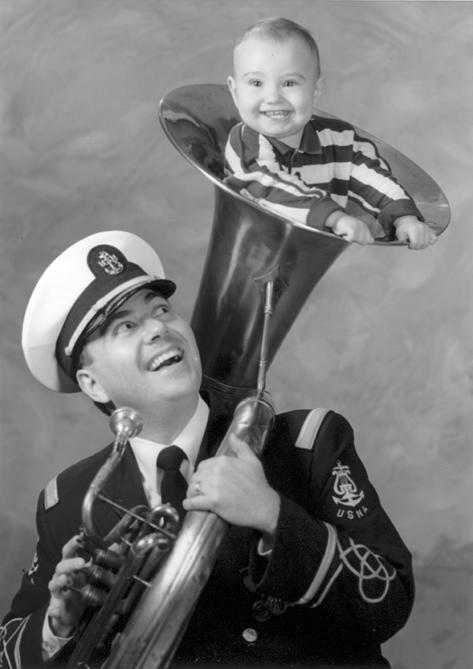 He enlisted in the Navy in 1989 as a trombonist with the U.S. Naval Academy Band in Annapolis, Maryland. There, he performed with the "Electric Brigade" Top 40 Ensemble, the Brass Quintet, and as principal trombonist with the Wind Ensemble. After promotion to Chief Petty Officer in 1997, he transferred to the U.S. Navy School of Music in Little Creek, Virginia, where he graduated first in his class from both the Ceremonial Conductor/Drum Major and the Enlisted Bandleader/Assistant Director courses. He then transferred to the Atlantic Fleet Band in Norfolk, Virginia, where he was the ceremonial band director and assistant concert band conductor prior to his commissioning in October 2000 and subsequent assignment to the U.S. Navy Band. Lieutenant Diane E. Nichols, a native of Buffalo, NY, became the 30th leader of the U.S. 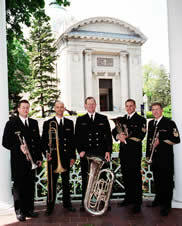 Naval Academy Band in 2014 and is the current leader of the band. She holds a Bachelor of Music Education degree from the State University of New York at Buffalo and a Masters of Music in Wind Band Conducting from Louisiana State University. She has completed the Navy’s Basic Music, Section Leader, Ceremonial Conductor/Drum Major, and Senior Musician courses, and has studied conducting with Anthony Maiello, Carlos Riazuelo, and Donald McKinney. Enlisting in the Navy in 1990 as a trumpet instrumentalist, she has served with Navy Band Southwest in San Diego, California; Pacific Fleet Band in Pearl Harbor, Hawaii; Atlantic Fleet Band in Norfolk, Virginia; and on staff at the Navy School of Music in Norfolk, Virginia. 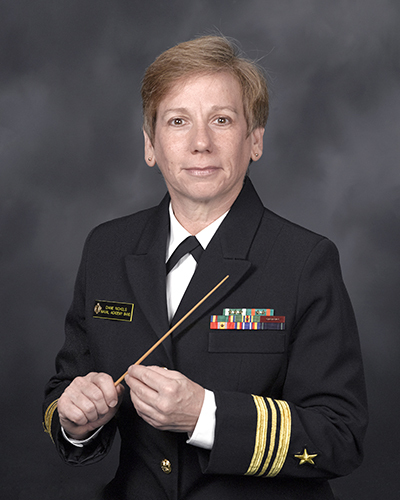 Commissioned as a Navy Bandmaster in 2005, she has served as the Assistant Director of the U. S. Naval Academy Band, Director of Navy Band New Orleans, Director of Navy Band Southwest, and currently as the Director of U.S. Naval Academy Band. 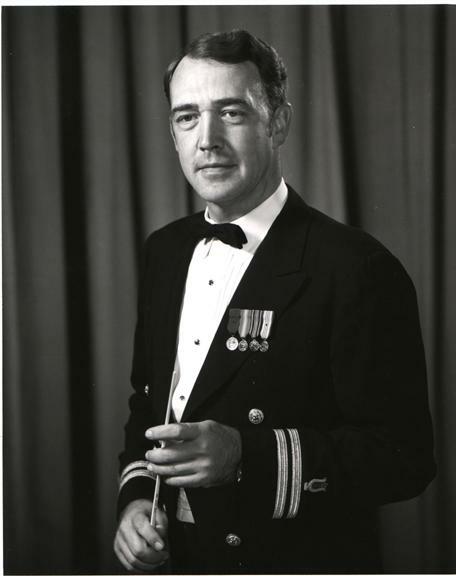 We would like to thank the following for their contributions to the preparation of this history: Lieutenant Commander Max Corrick, USN, former leader of the Naval Academy Band from 1957 to 1966; Chief Musician F.C. 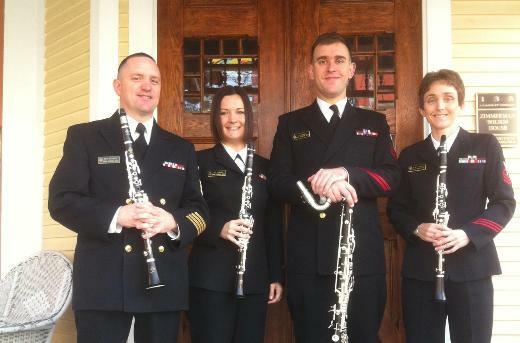 Jones, former research assistant of the Naval Academy Band; Senior Chief Musician Kathryn Callahan, USN, (Ret) former Chief in Charge of the USNA Band Special Projects Office and Oboist; Mr. James Cheevers, Curator of the Naval Academy Museum; Dr. Jennifer A. Bryan, Head of the Special Collections & Archives Division of the Nimitz Library along with Gary A. LaValley and Beverly J. Lyall; The USNA Photo Lab Staff; Mr. Dave Eckard, Mr. Wayne McCrea, Mr. Ken Mierzejewski, and Mr. Cliff Maxwell.